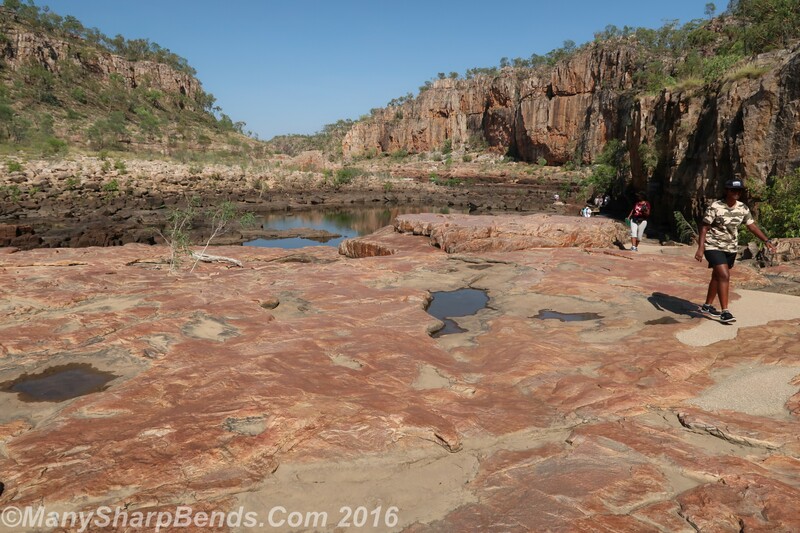 After an exhilarating 10 days in Queensland, it was time to explore the Australian “Outback” (Aussie for wilderness) at Northern Territory – the remotest and least known of all Australian states, but the most beautiful and “real” Australia in our opinion. 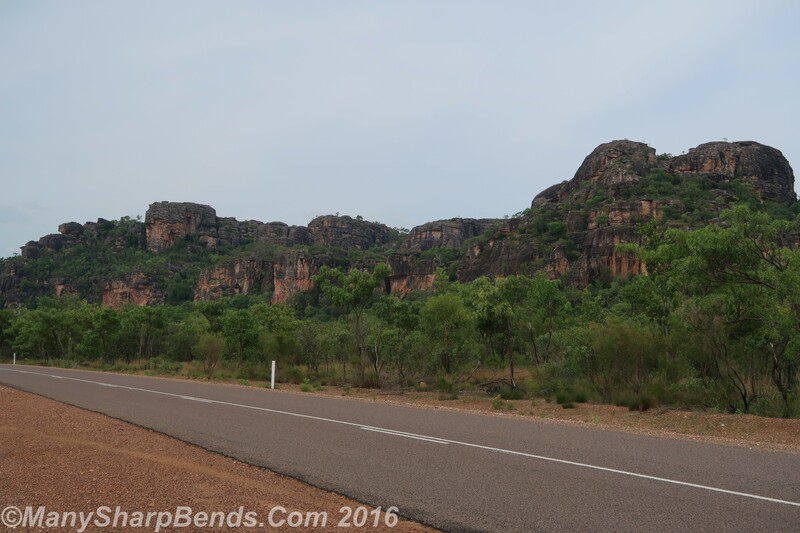 Most tourists confine themselves to the standard “Melbourne-Sydney-Gold Coast” circuit – that’s a real shame in our opinion, as the true riches lie in NT. 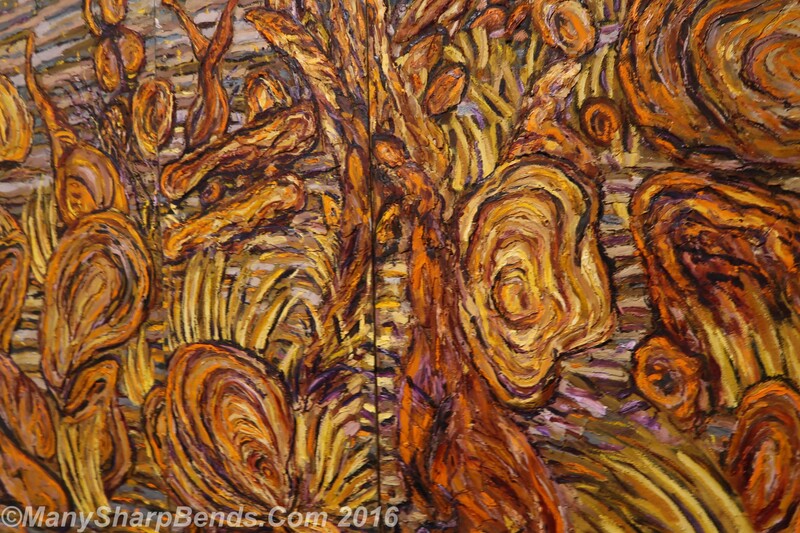 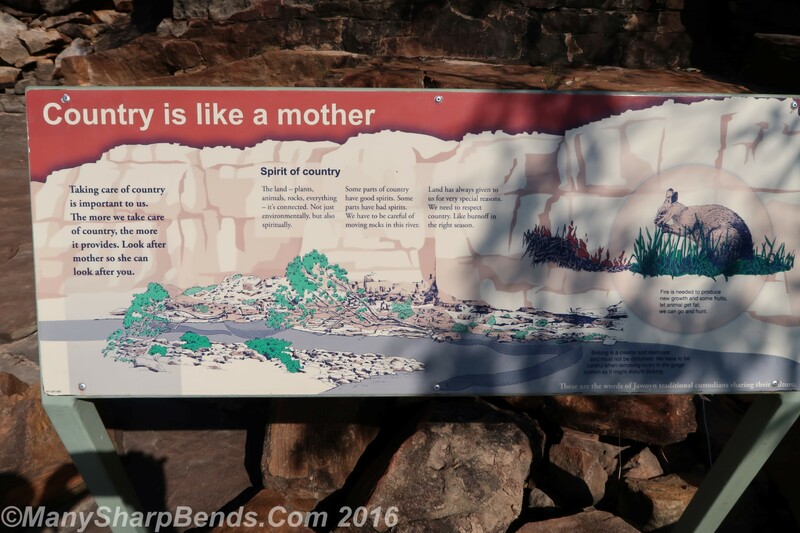 The famed Uluru & Kata Tjuta rocks also belong to NT but that is for another blog. 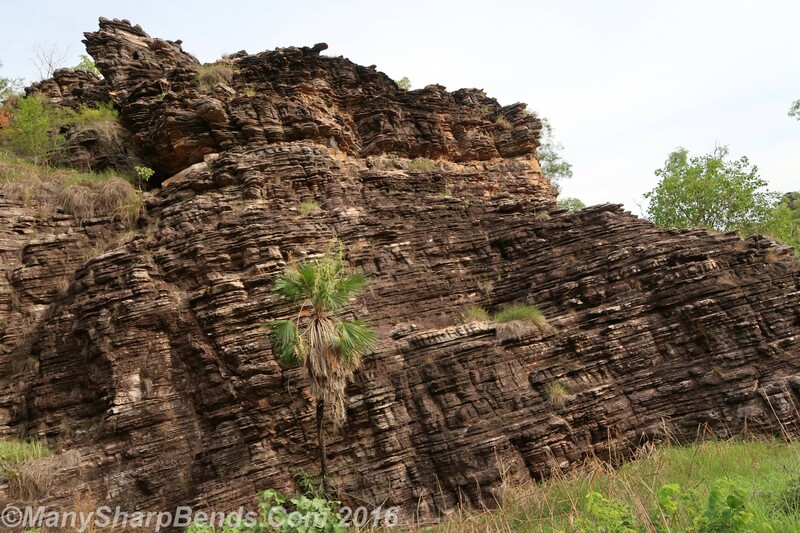 Darwin as the base to explore the upper part of Northern Territory reminded us of North East India – so far from main action that it seems another world. 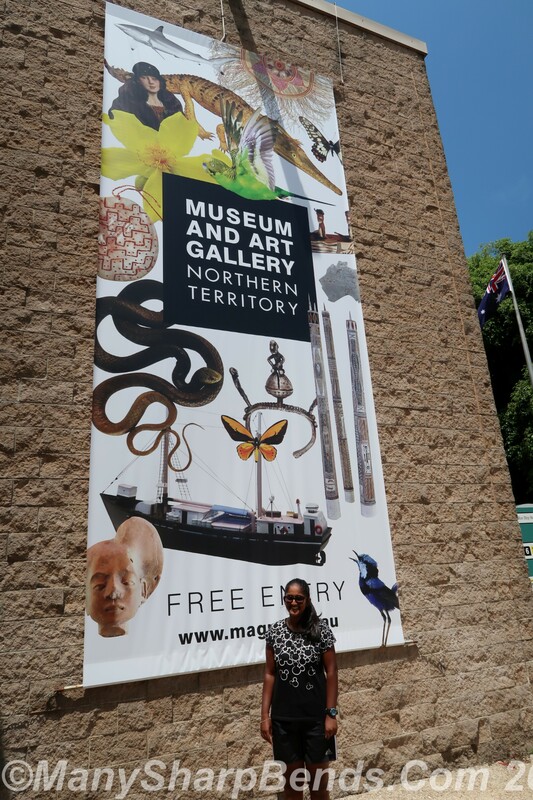 It is closer to Timor Sea and Papua New Guinea than main parts of Australia ! 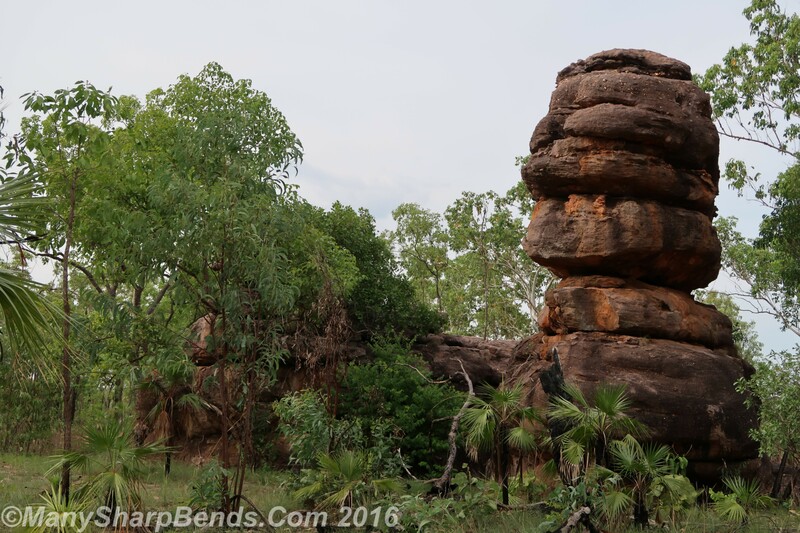 After being penalized 50 AUD by Jetstar for excess baggage in the previous leg, the Air North flight from Cairns to Darwin via Gove, was a real charm with free food and baggage allowance. 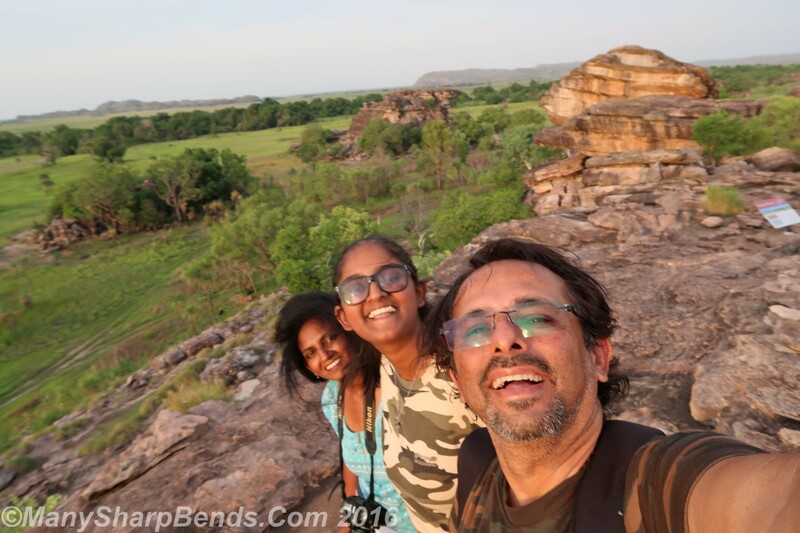 We landed in the tropical heat of Darwin and were immediately upgraded by the Punjabi dude at Hertz counter from sedan to SUV. 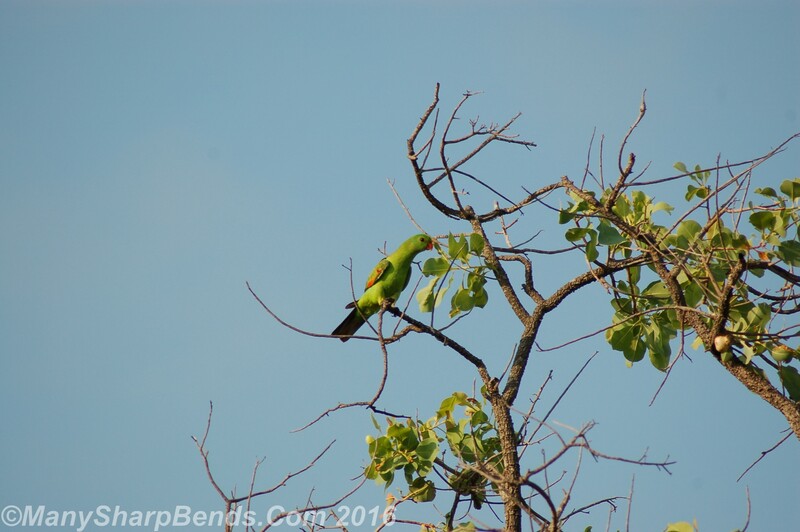 You can take an Indian out of India but you can’t take India out of him/her! 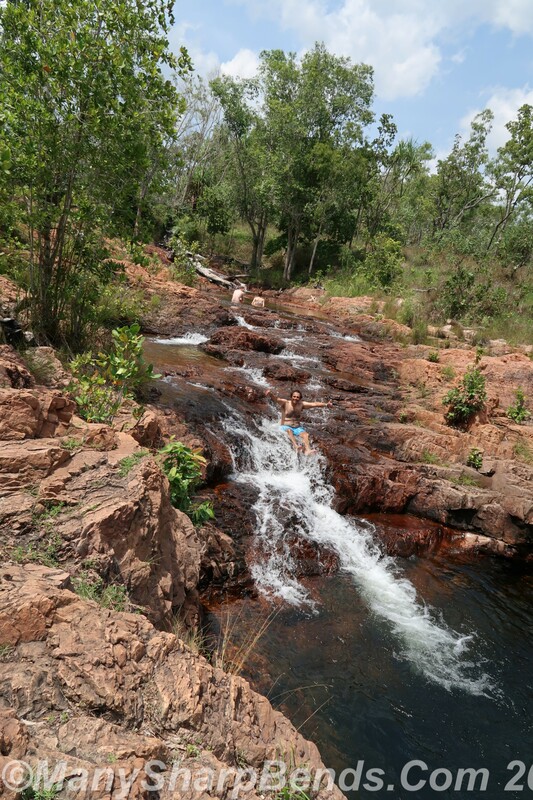 Darwin is primarily a launch pad to explore the national parks of NT – notably Kakadu, Litchfield & Katherine. 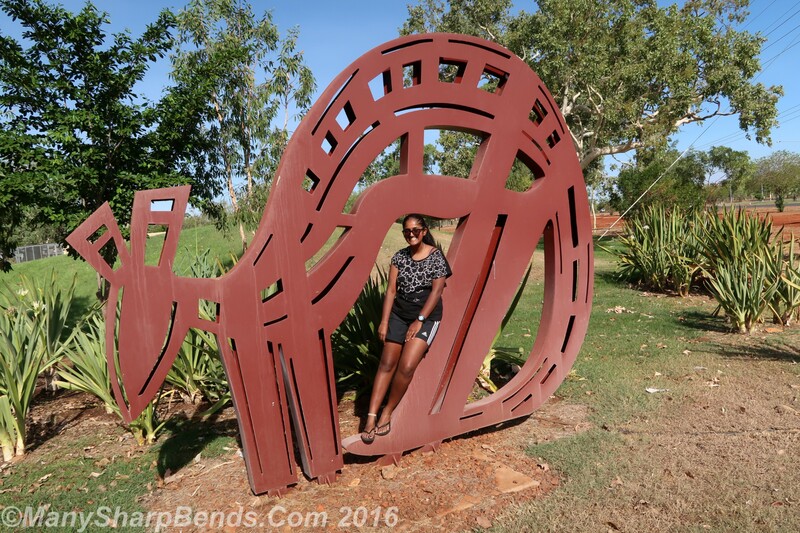 We hung around for a day exploring the botanical garden, NT museum and the waterfront. 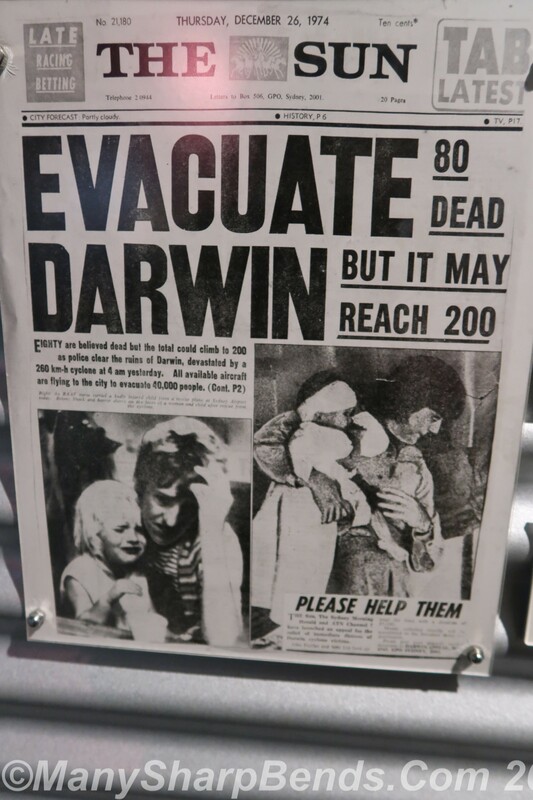 Darwin was at the center of action during WW II and also was devastated by Cyclone Tracy in 1974 in which 65 people perished. 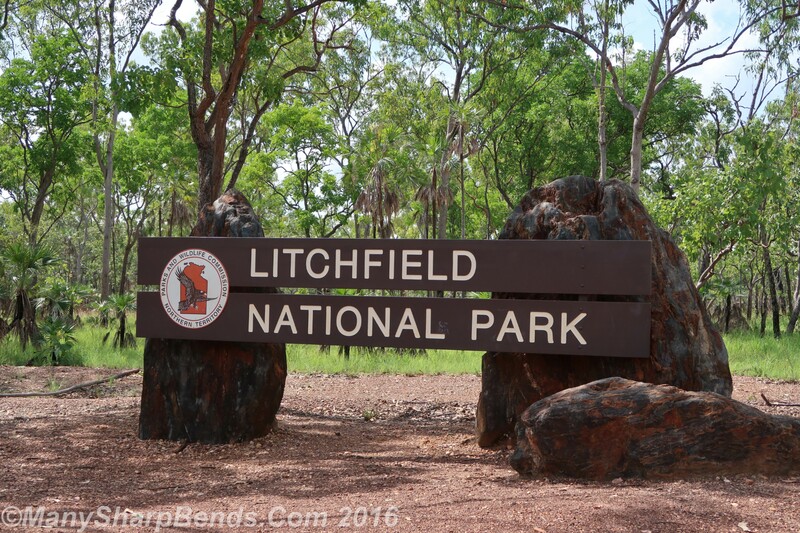 Having made full use of the Ramada infinity pool, our real outback journey began the next morning as we headed off through Stuart highway to Litchfield National Park – famous for its lovely swimming rock pools and termite mounds. 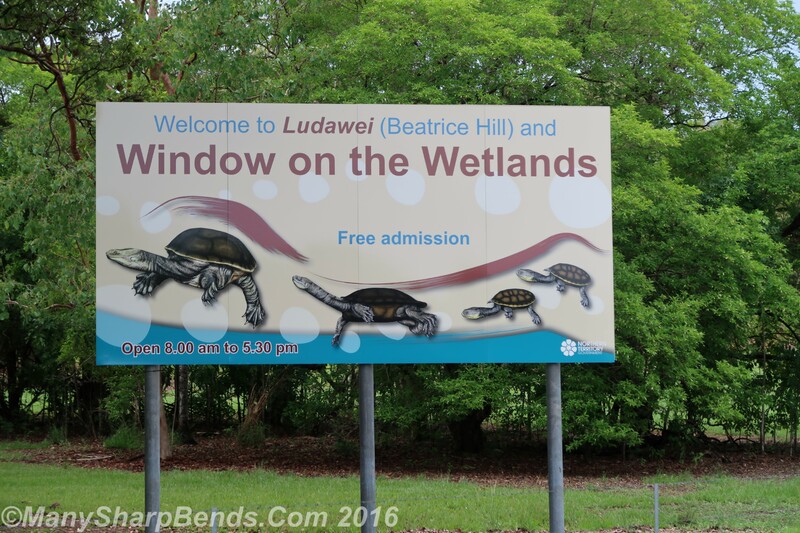 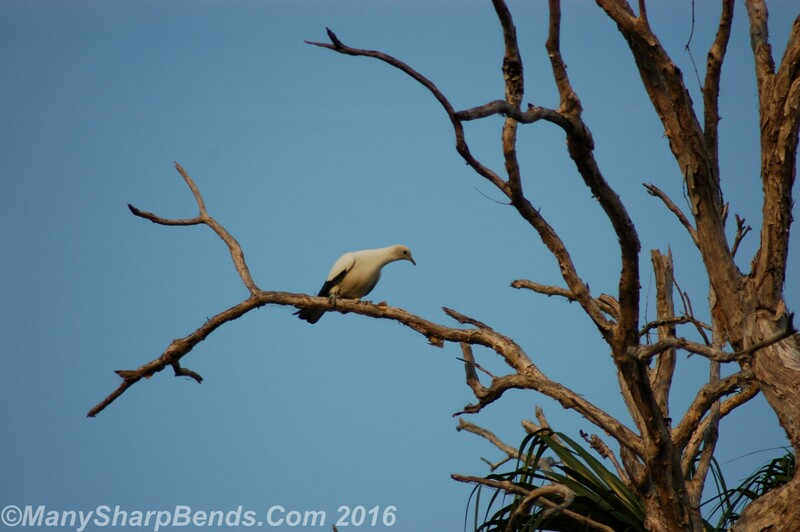 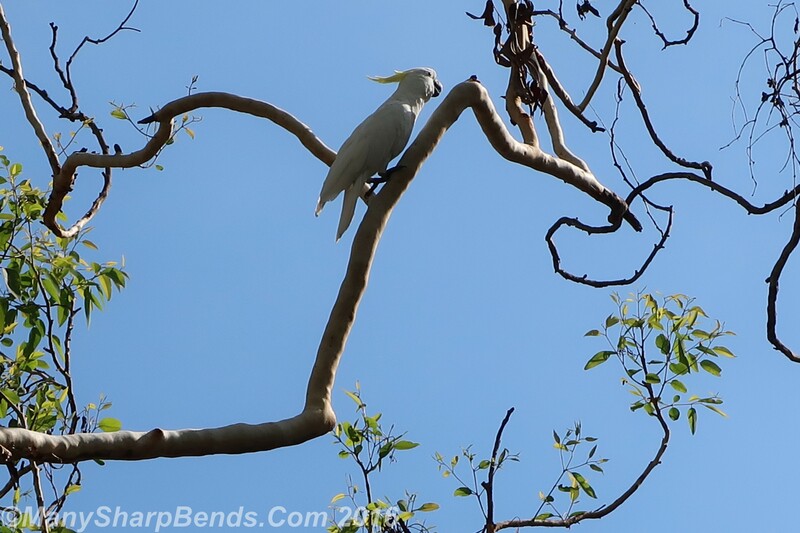 We stopped briefly at the small town of Batchelor to capture some interesting bird life, including our first glimpse of the lovely sulphur-crested cockatoo. 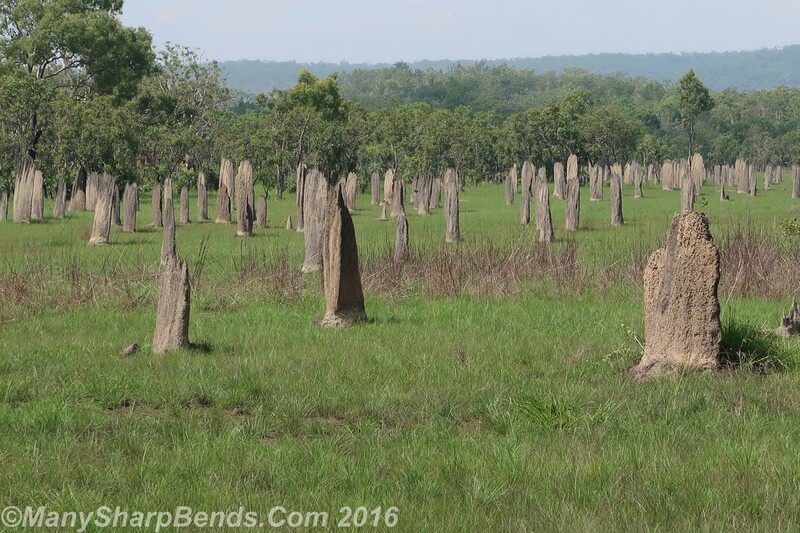 Soon after the magnetic termite mounds appeared – looking like tombstones. 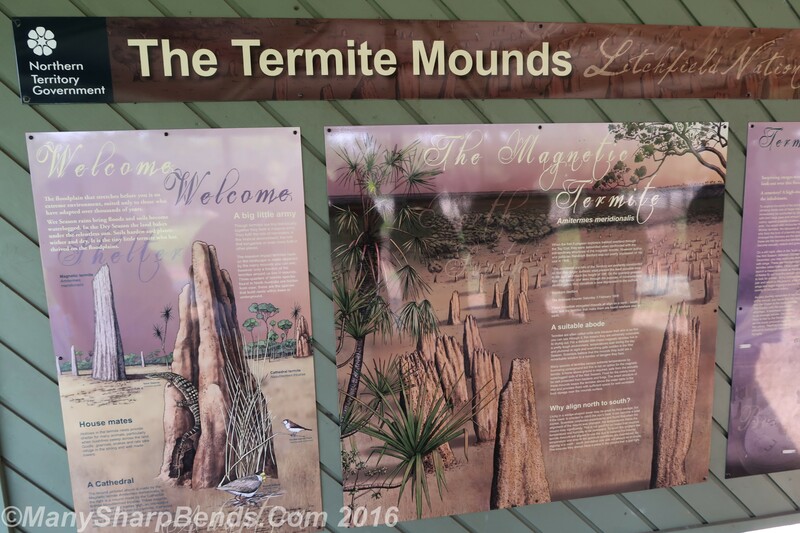 Built by termites they are amazing architectural wonders containing arches, tunnels, chimneys etc, and are aligned north-south to minimize exposure to sun. 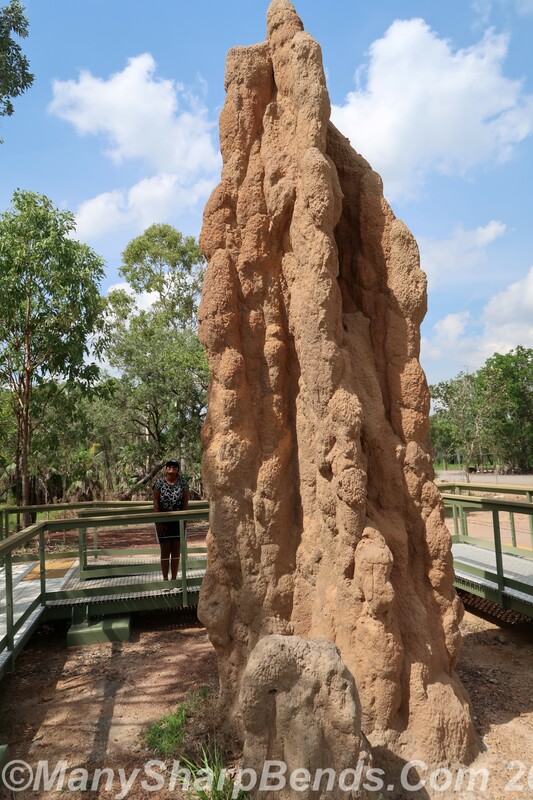 You also get to see the giant Cathedral Termite mounds. 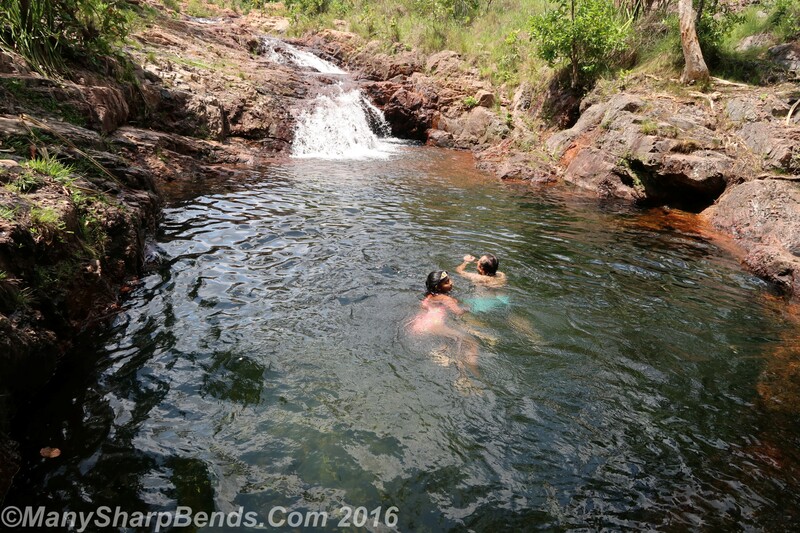 It was time to swim in the lovely rock pool of Buley Rock Hole, where the water cascades through a series of rock pools. 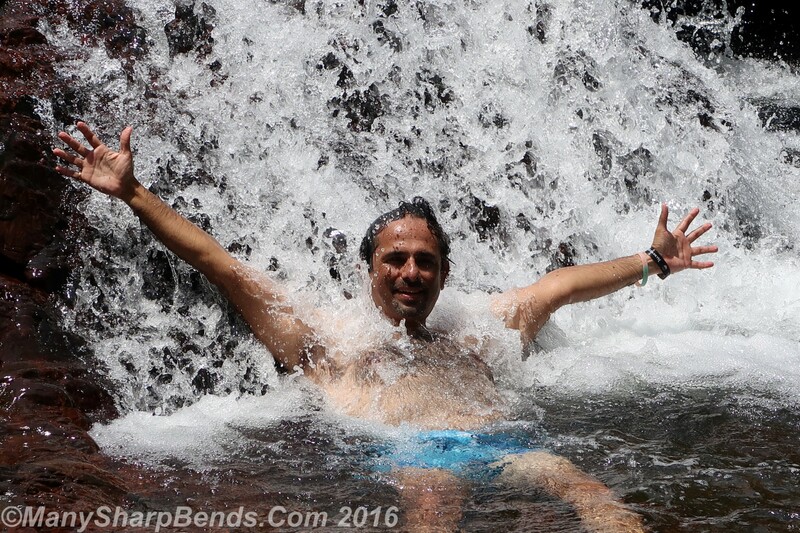 Next up was Florence falls with a steep descent to a deep pool surrounded by lush greenery. 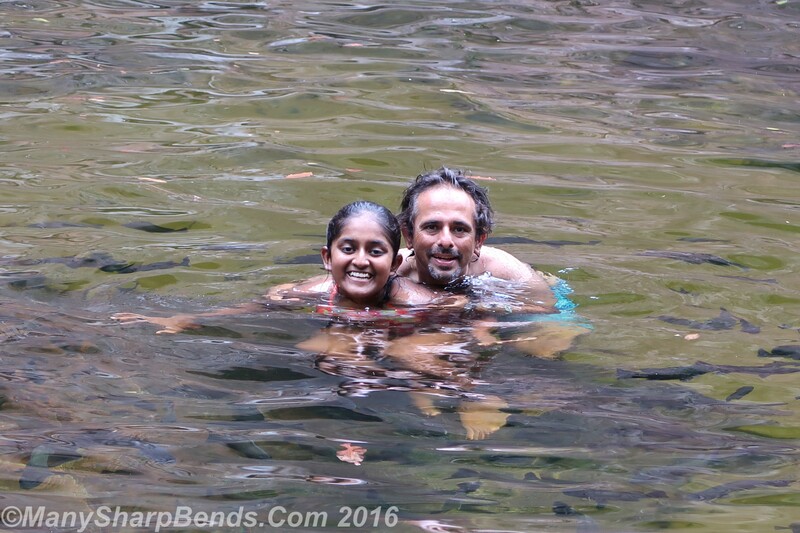 We were brave enough only to venture in the shallow part. 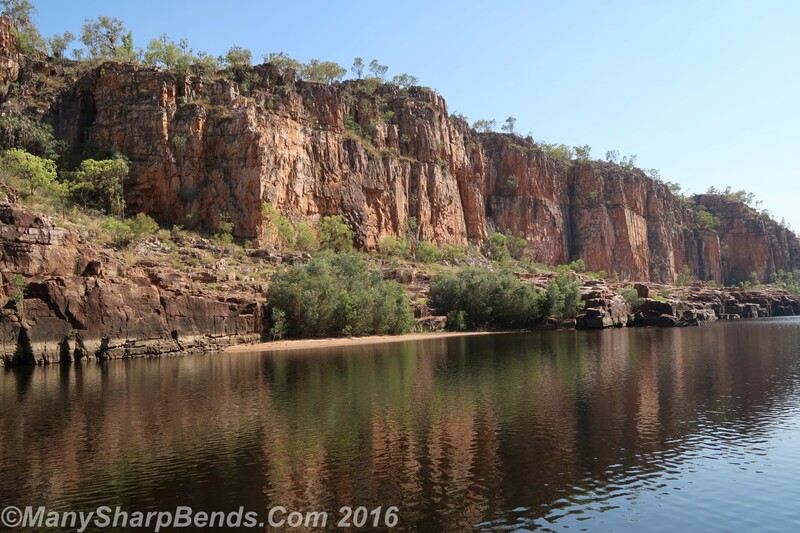 Some intrepid souls were doing cliff jumping – too adventurous for us. 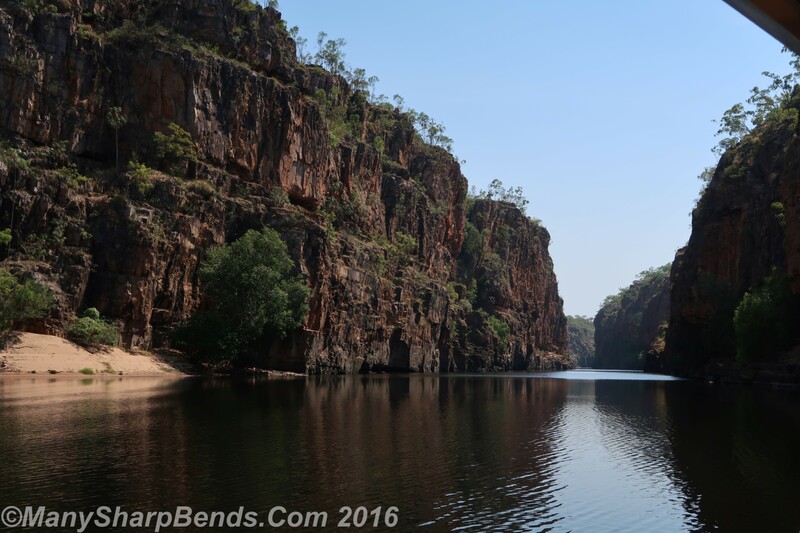 Litchfield done, a four hour drive brought us to Katherine which is famous for its gorges. 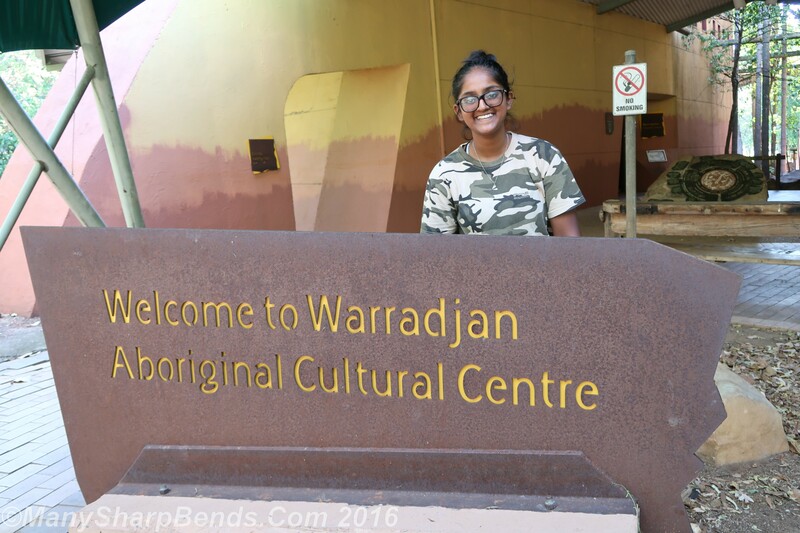 A quick visit to the culture center was a flop as there was nothing to see but Mika posed for the customary photos nevertheless. 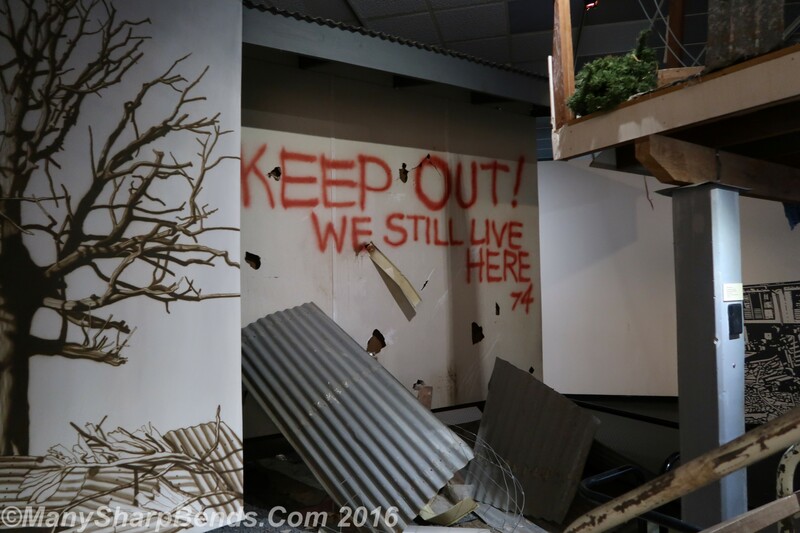 Beagle Motor Inn was bit of a disaster with tiny rooms and antique microwave which meant it took more than hour to heat our pasta. 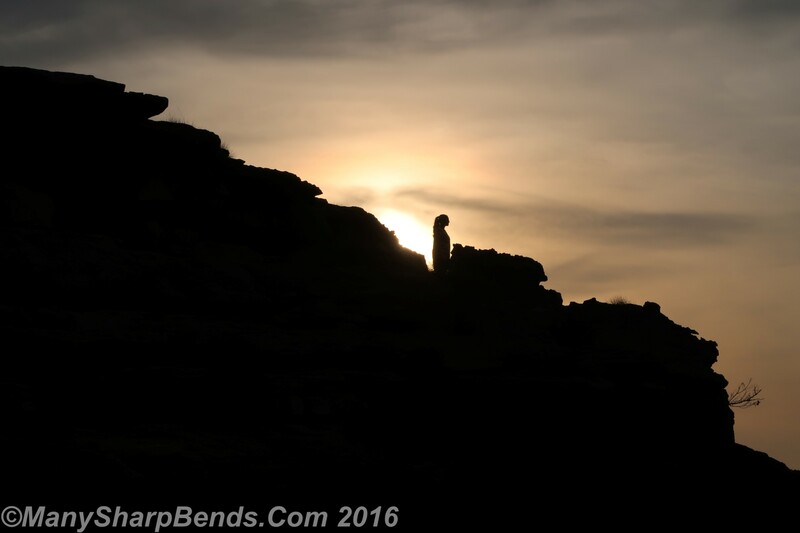 Oh well, it cannot beat El Mirador in Cusco – our worst accomodation of the trip. 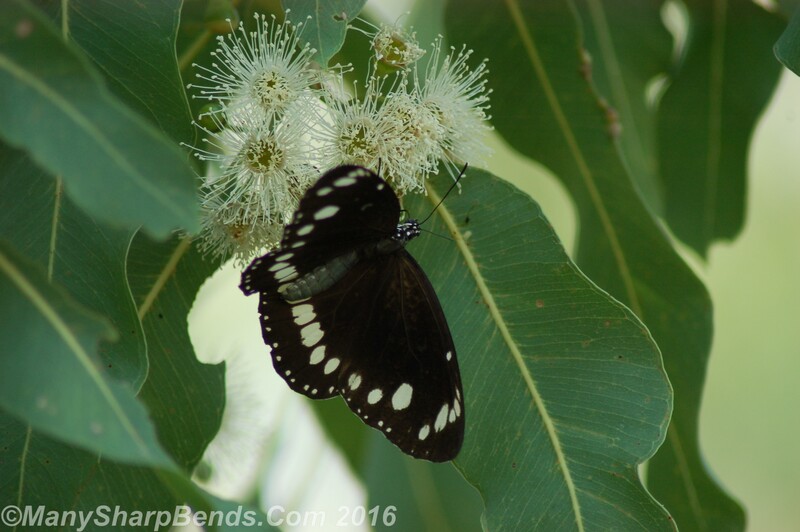 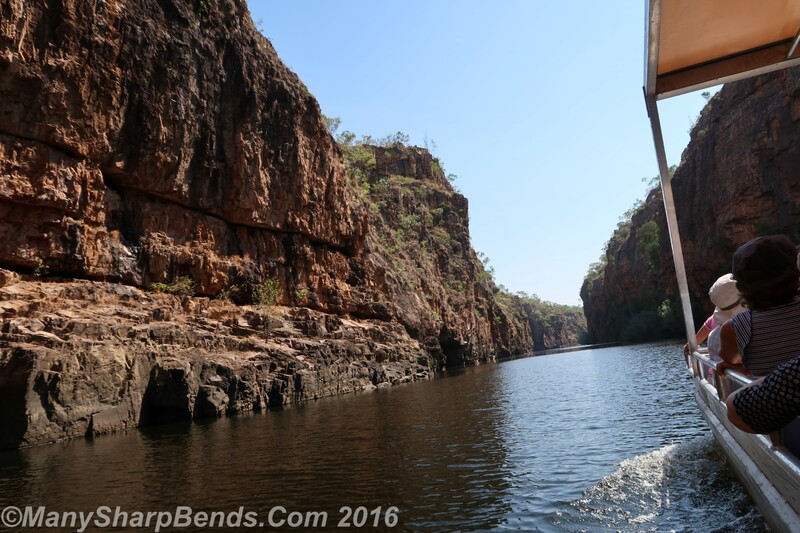 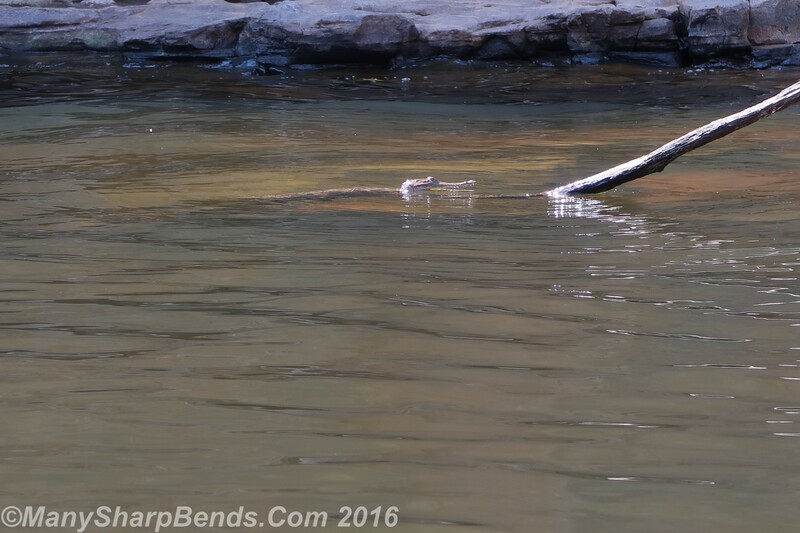 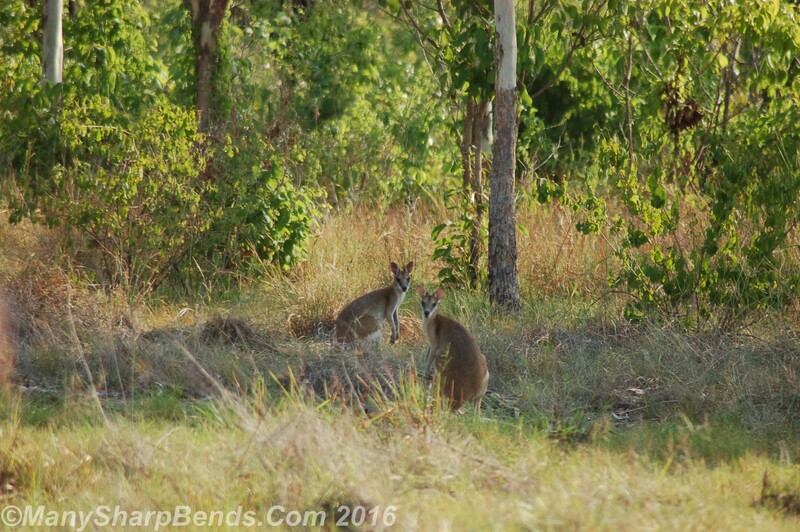 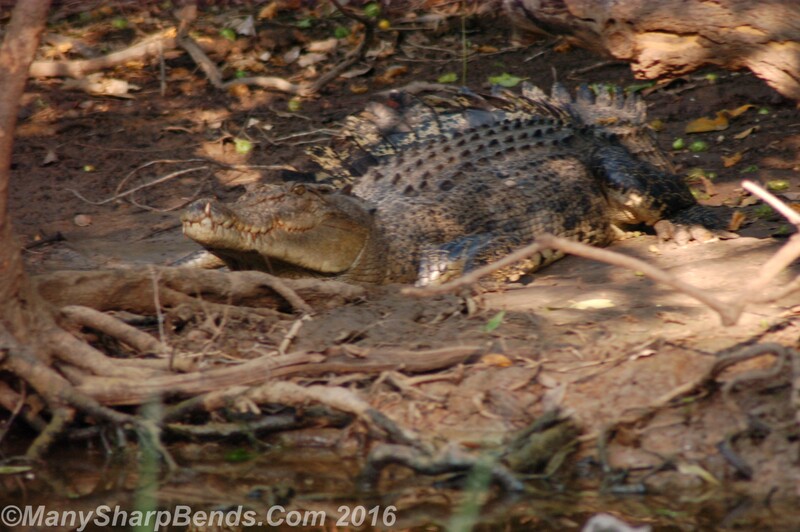 Next morning we headed off to the famed 2-gorge tour of Katherine gorge, but not before meeting some exciting wild life at the boat landing. 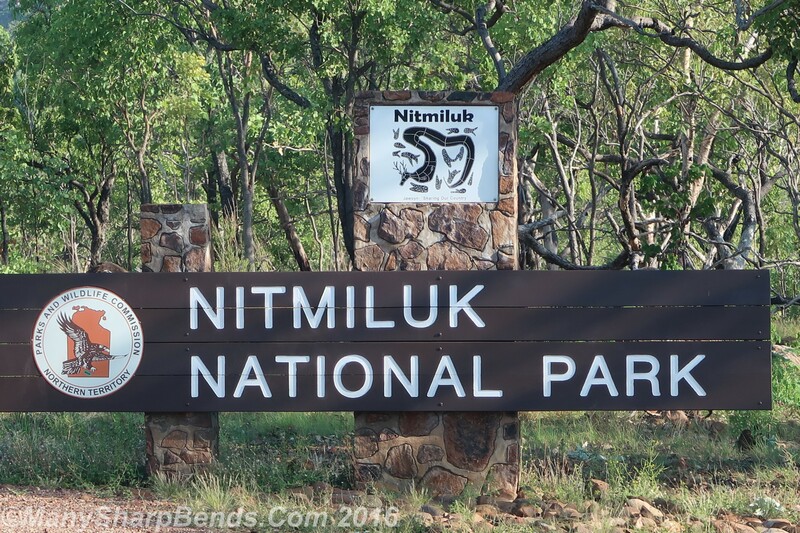 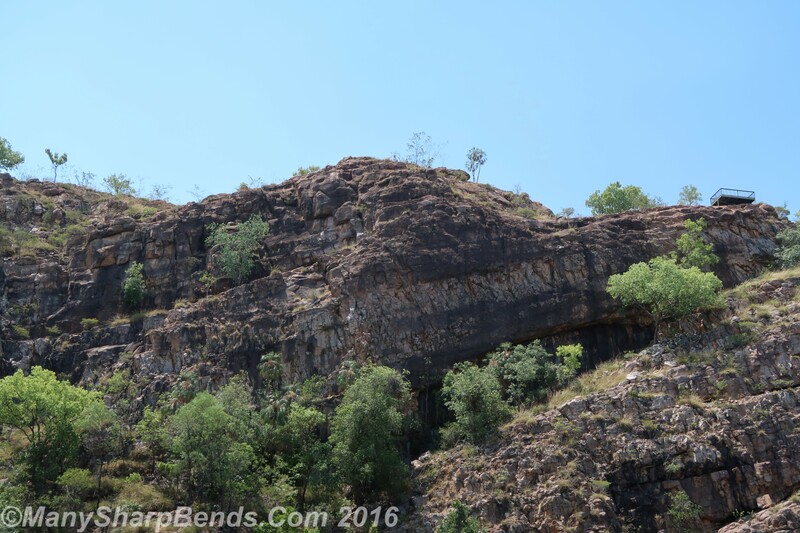 The Nitmiluk gorge tour (Nitmiluk is the original Aboriginal name of Katherine) reminded us of the Colorado river and Grand Canyon. 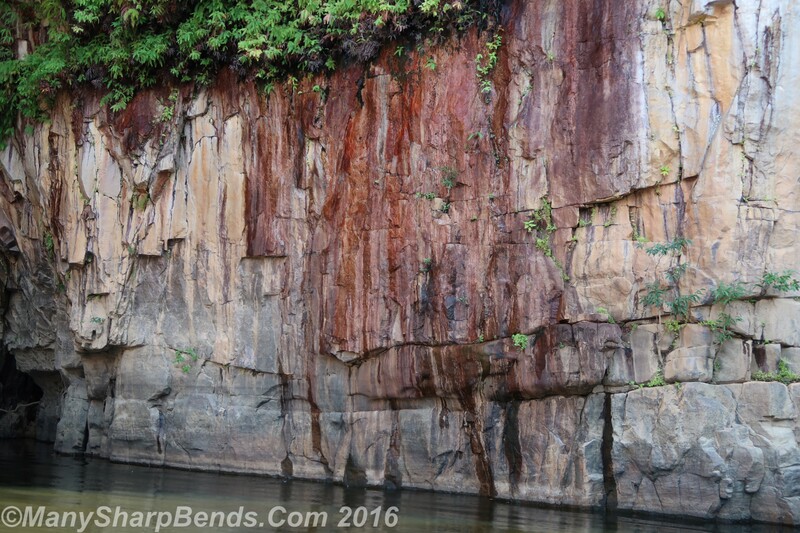 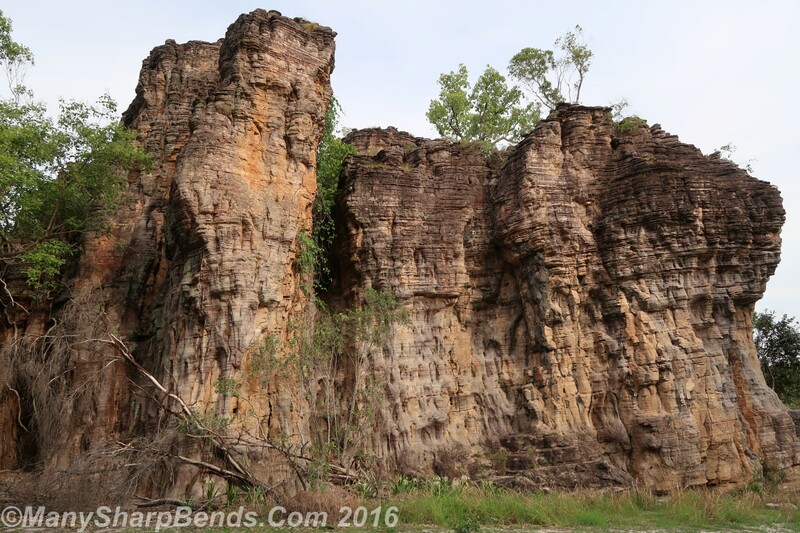 A series of 13 deep sandstone gorges have been cut by nature through Katherine river between Arnhem land and Timor sea. 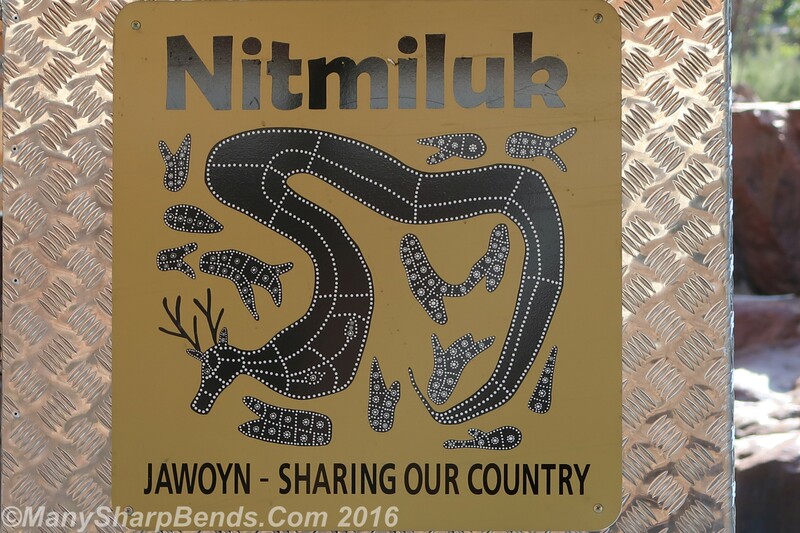 Jawoyn people are the traditional Aboriginal owners of this land who manage the park in partnership with the Australian government. 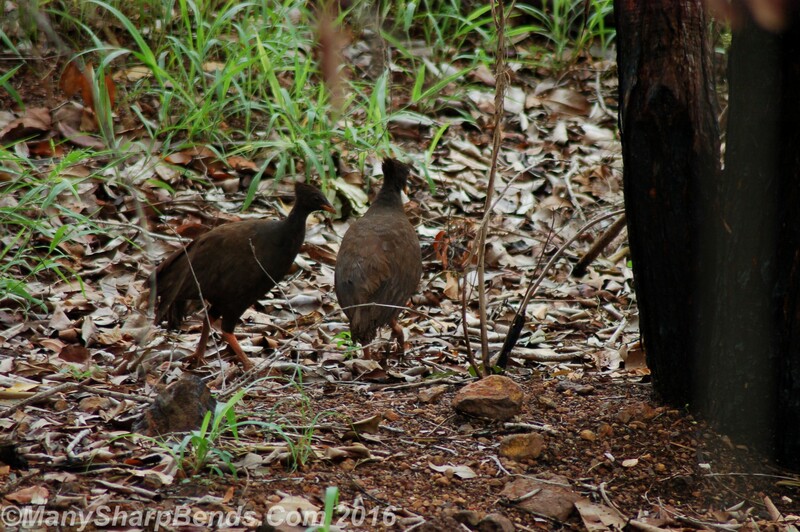 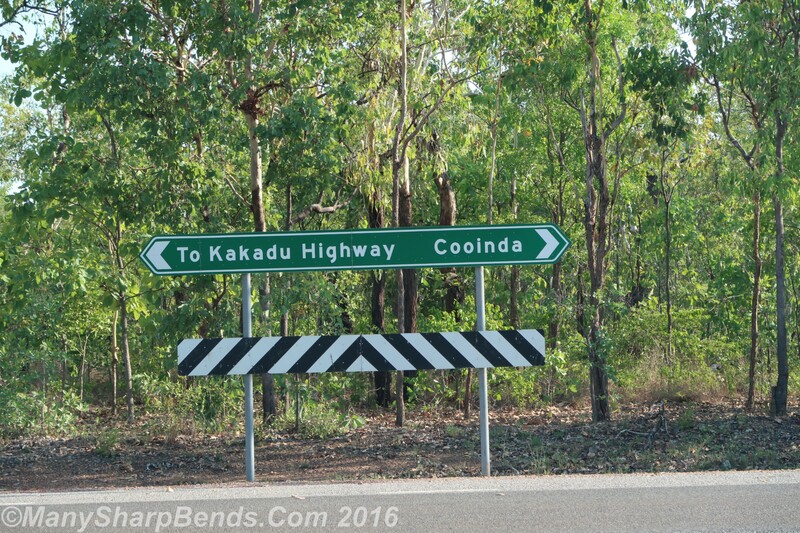 Another four hour drive through Arnhem Highway brings us to Cooinda, our first stop in Kakadu National Park. 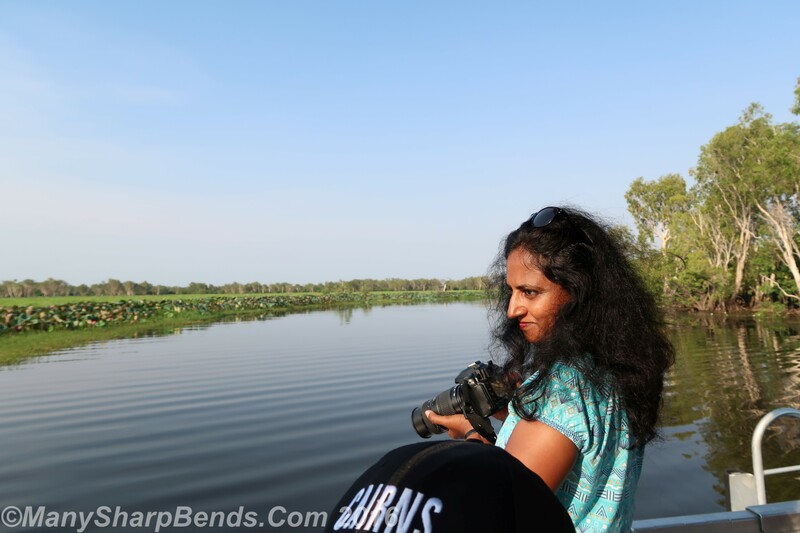 Not before bit off a scary adventure when I momentarily dozed off behind the wheels almost causing an accident! 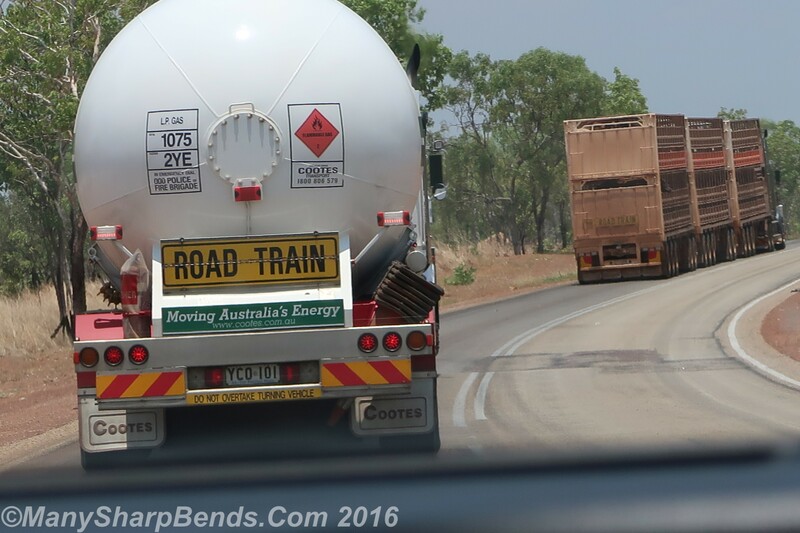 And boy we loved those cargo trucks which are amusingly called as “Road Trains” ! 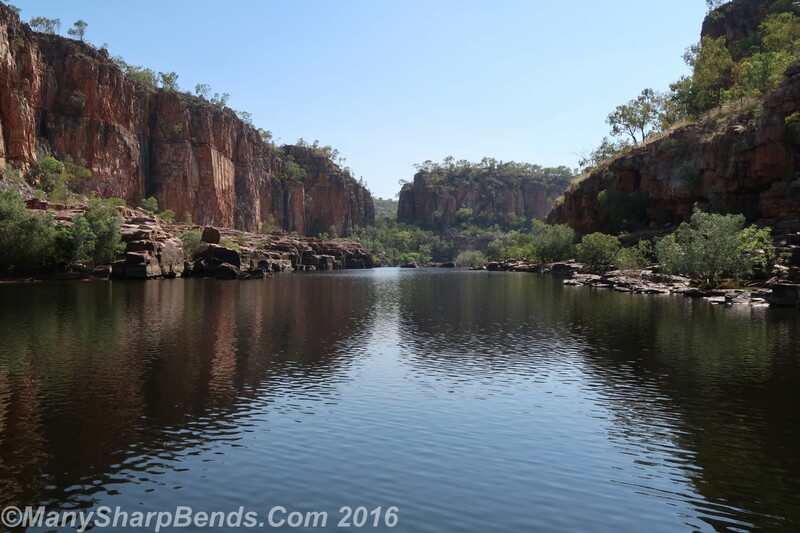 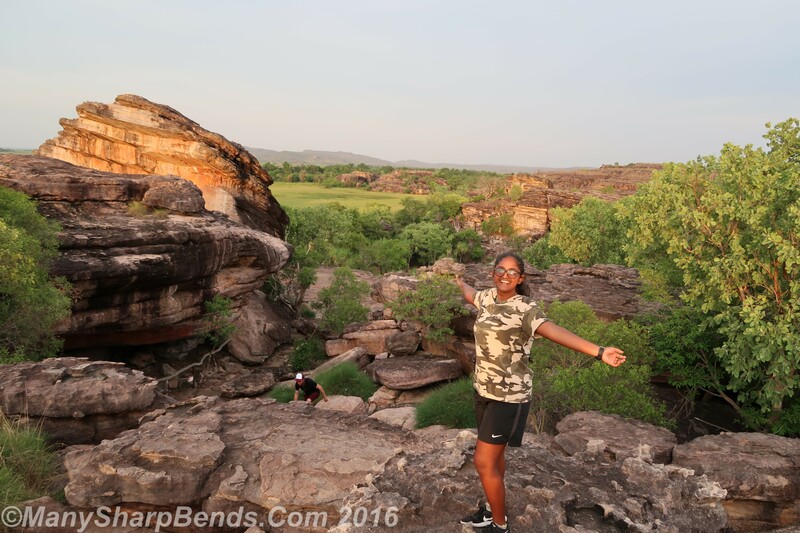 Kakadu National Park, 20000 sq kms in area, is famous for Aboriginal culture, Rock art, billabongs (water ways) and some lovely wildlife and birds. 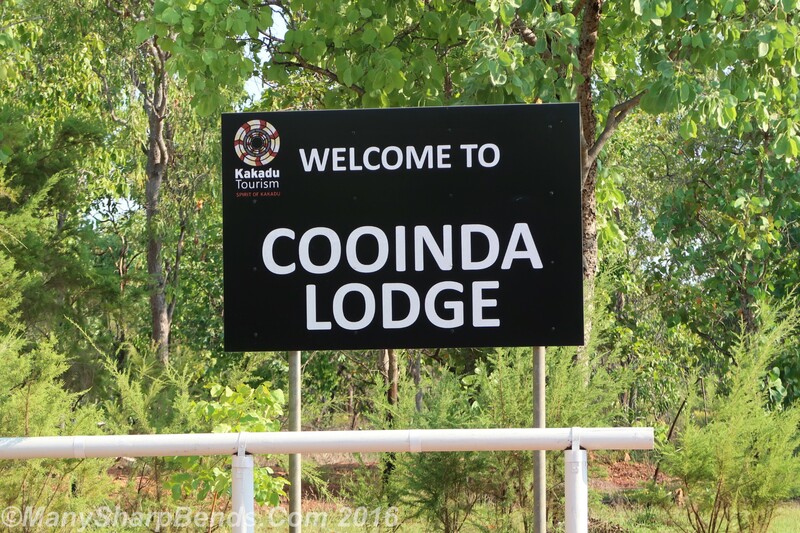 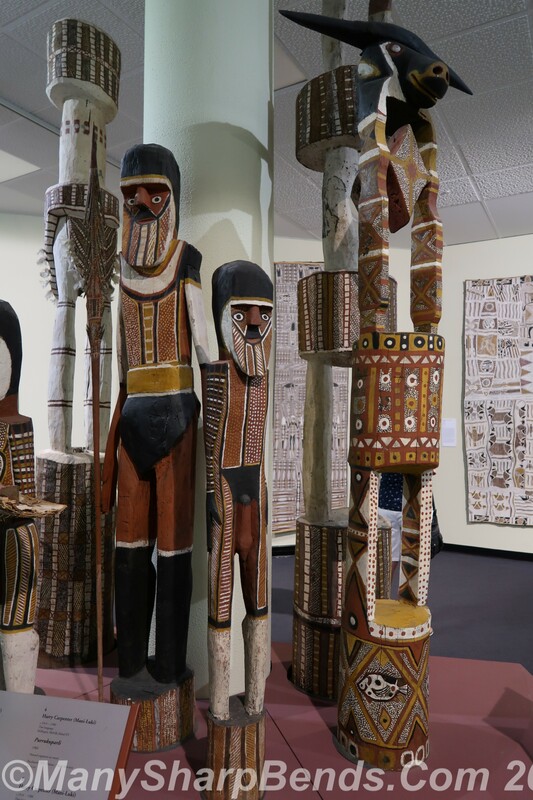 We checked into Cooinda lodge and headed straight to the Warradjan Aboriginal culture center, which depicts the aboriginal culture. 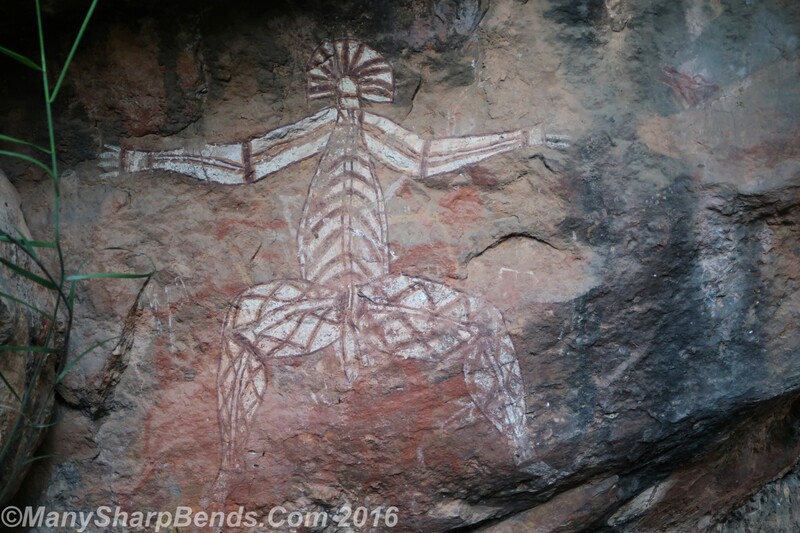 Armed with the initial orientation, we headed off to Nourlangie – which has an imposing escarpment of red stand stone and famed rock art. 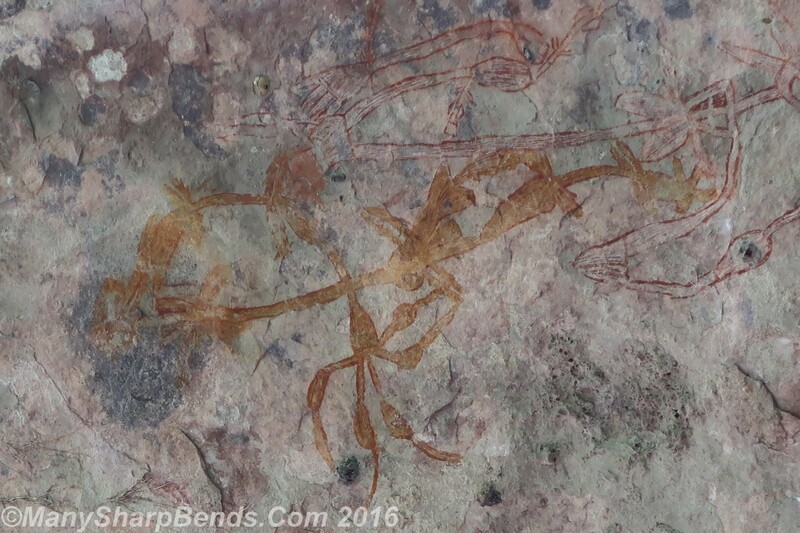 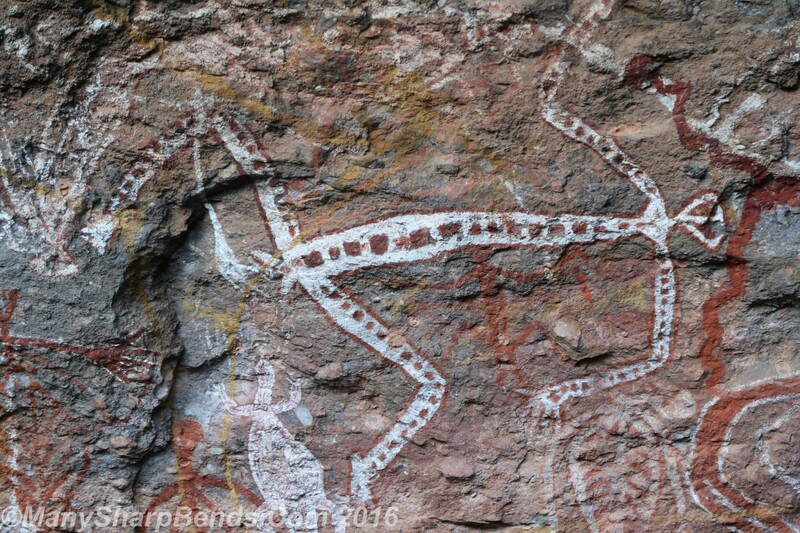 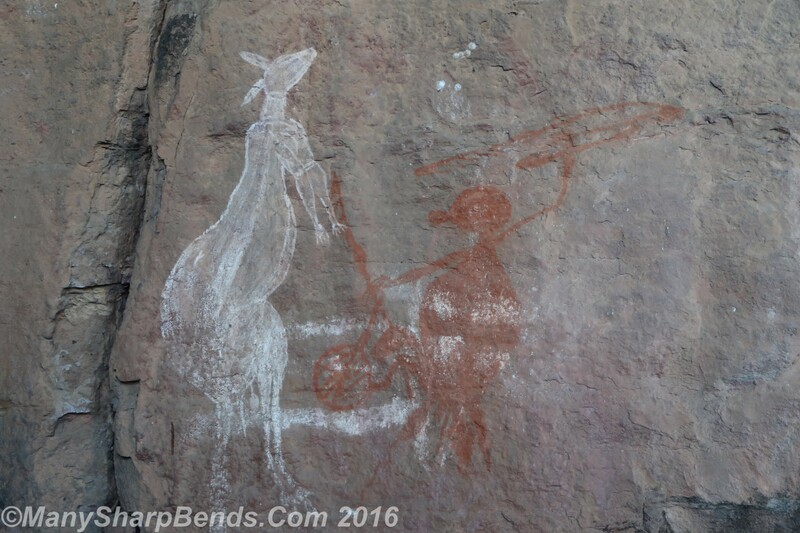 The rock art which is between 20,000 to 10 years old, depicts “dreaming” stories and its an important cultural link between Aboriginal people and their ancestoral teachings. 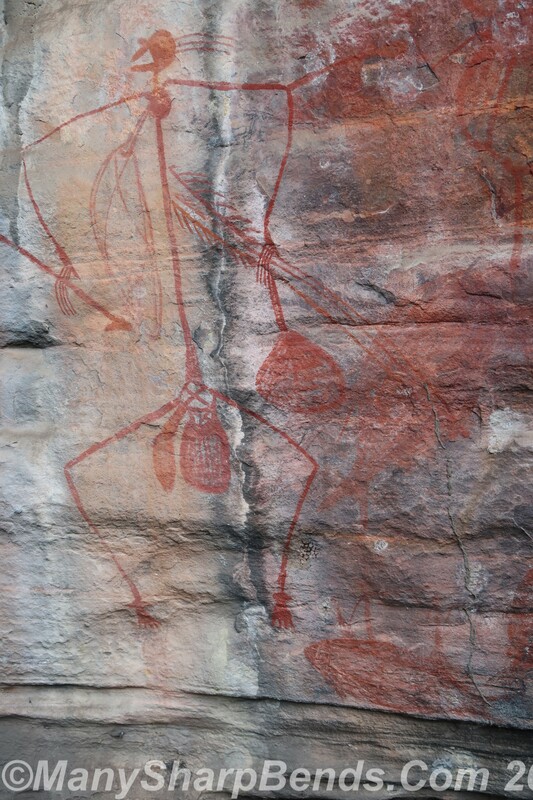 Some paintings are believed to have been made by mimi spirits (the “creation” ancestors) – a fact difficult to dispute , given the amazing height of some of these paintings which are impossible for humans to climb ! 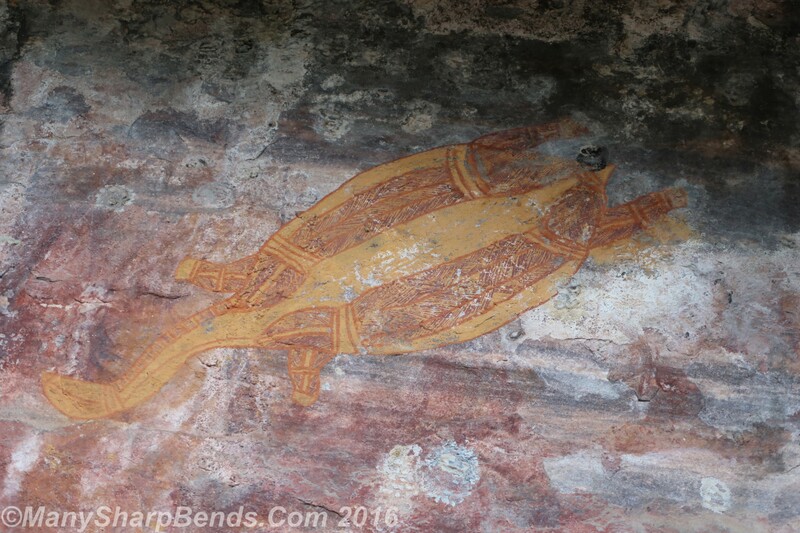 The 2 km walking loop took us first to Anbangbang Shelter which was used for refuge, and then to Anbangbang Gallery – the famed rock art. 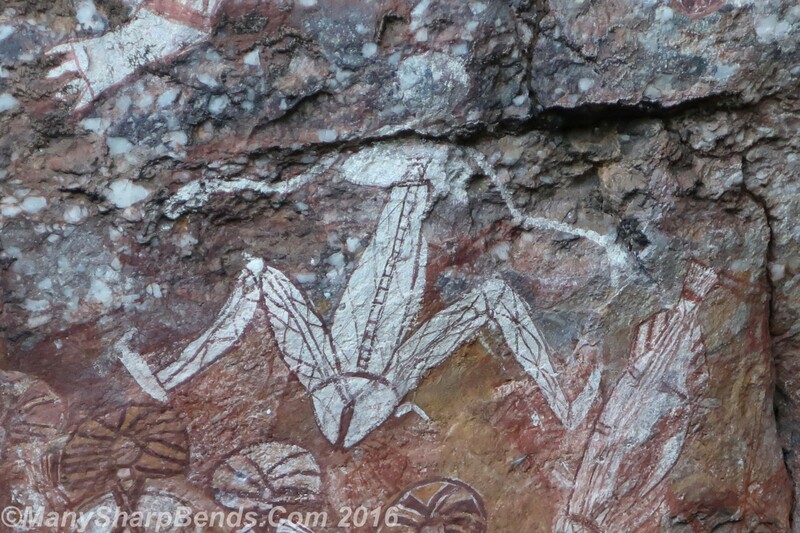 One of the main paintings features Nabulwinjbulwinj, the mean spirit who ate females ! 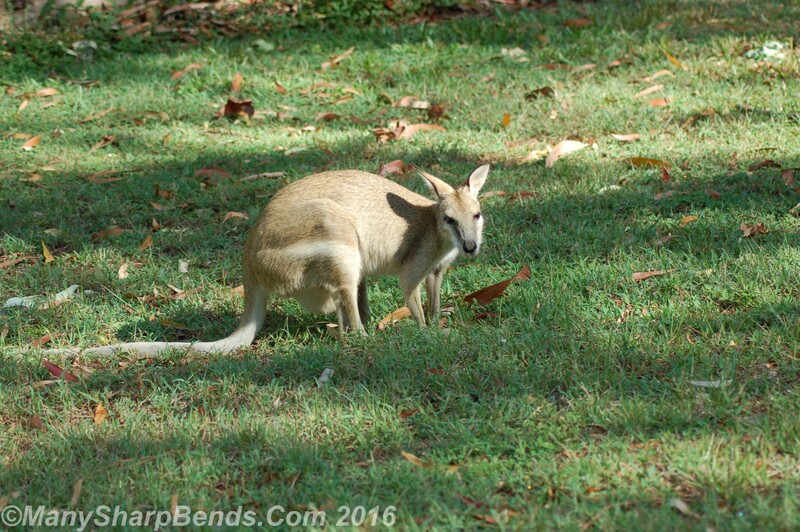 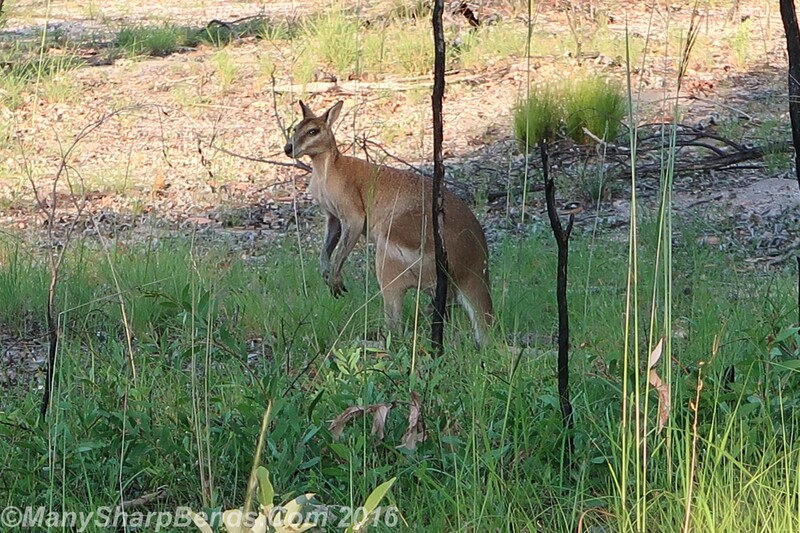 On the way in, we had been rewarded with a chance encounter with a Wallaroo. 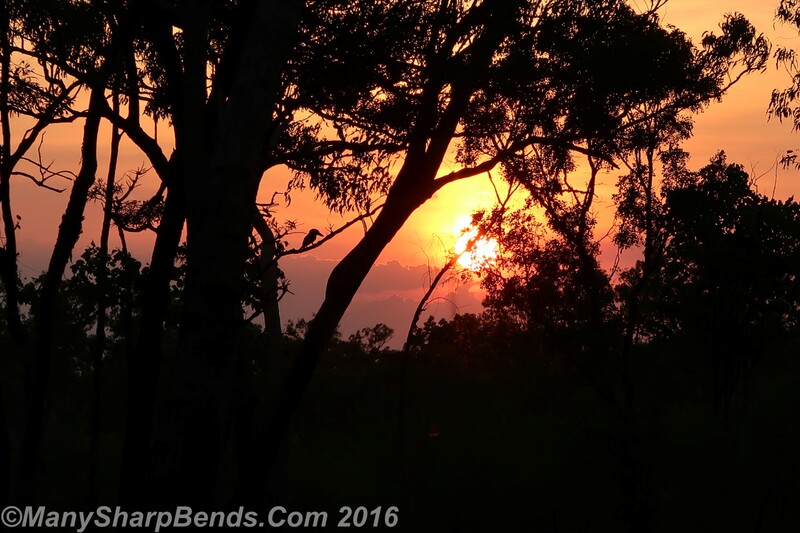 A spectacular sunset was just the right way to wind down today’s proceedings. 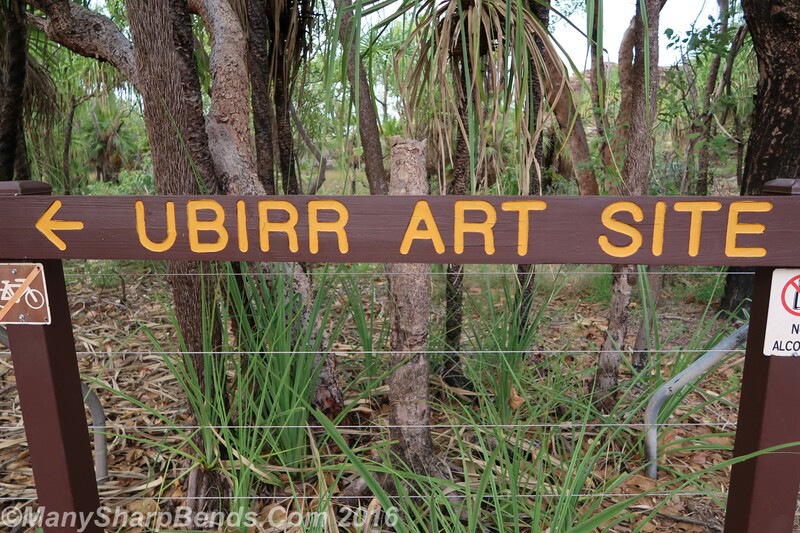 As an aside, the Nourlangie traditional owners rejected millions of dollars in revenues from French nuclear giant Areva for uranium mining, choosing to integrate that land with the national park – an amazingly positive example of environment conservation. 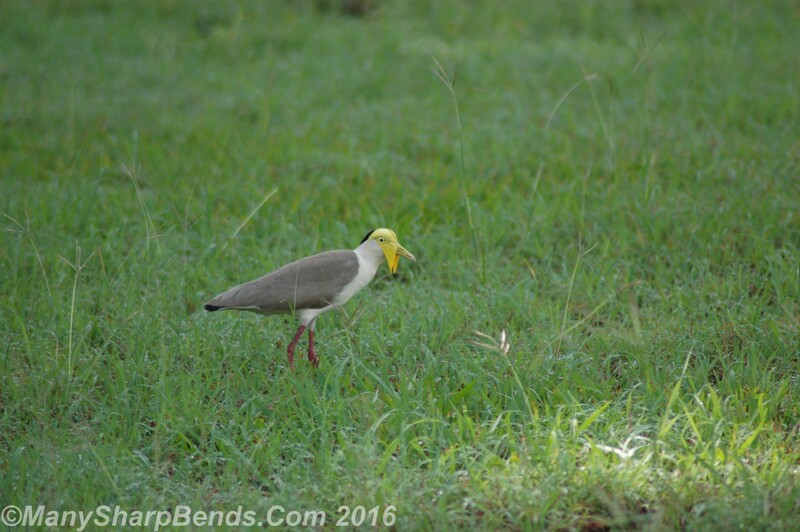 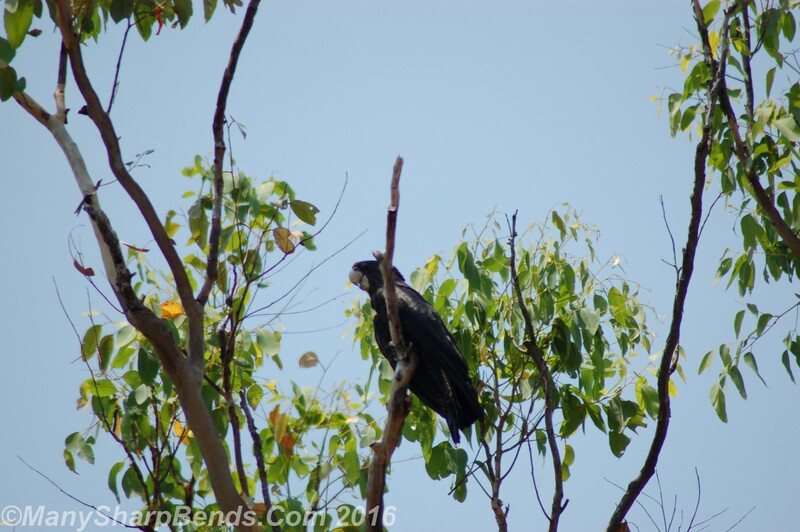 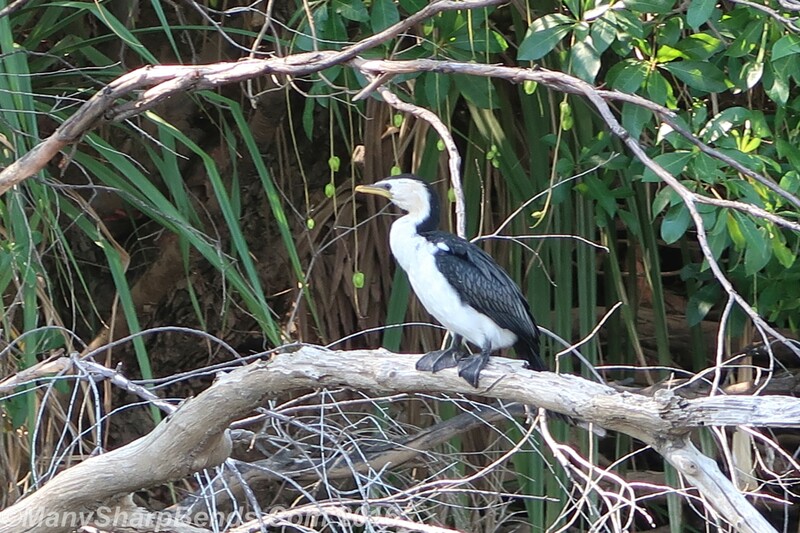 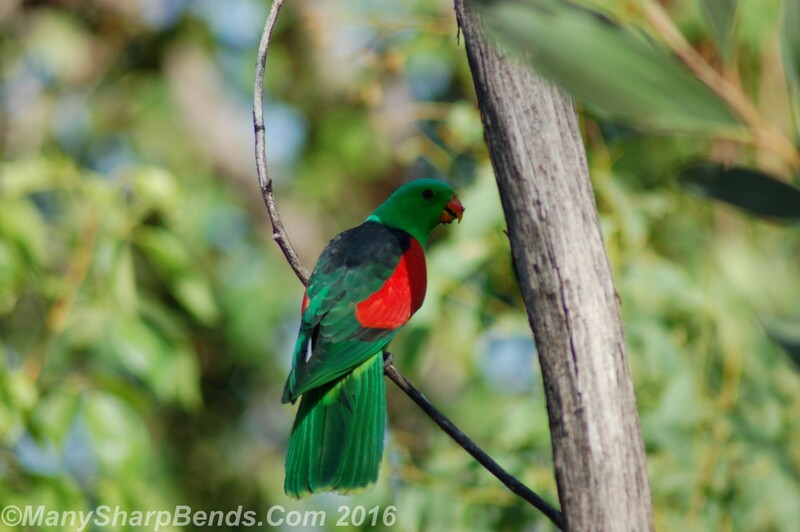 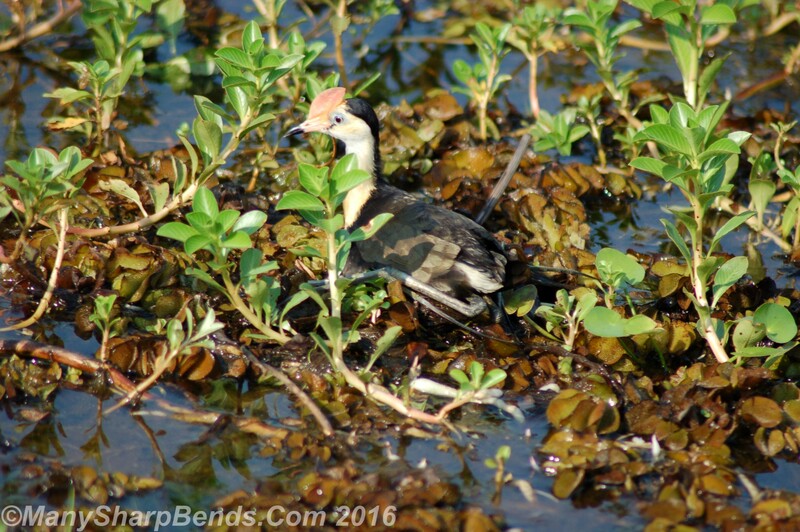 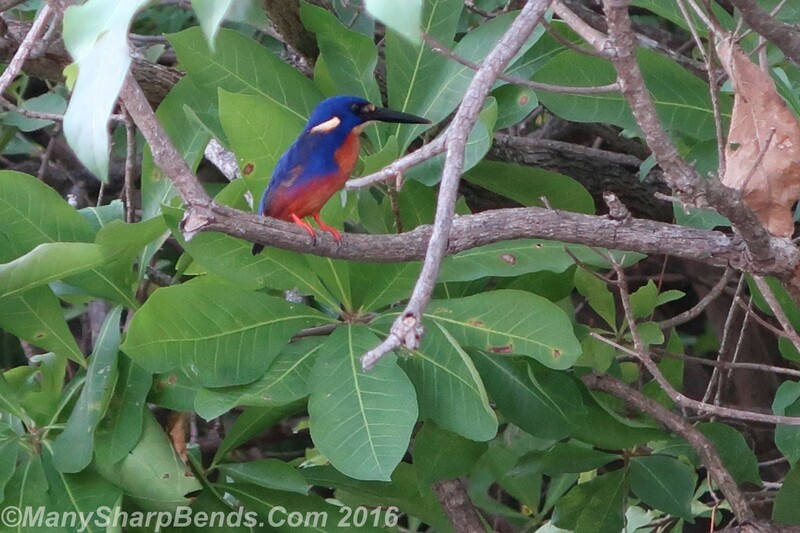 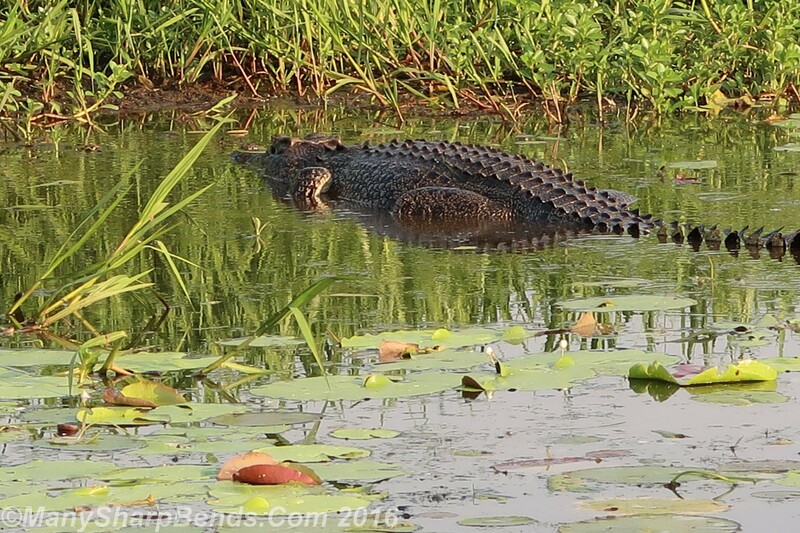 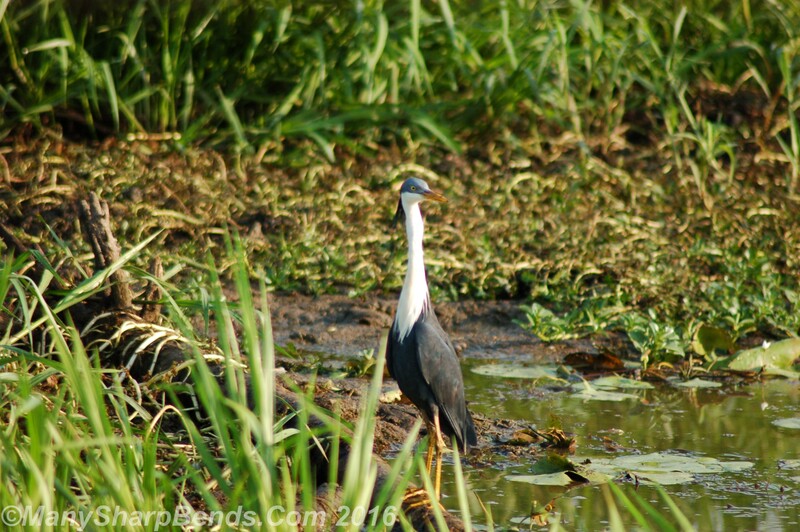 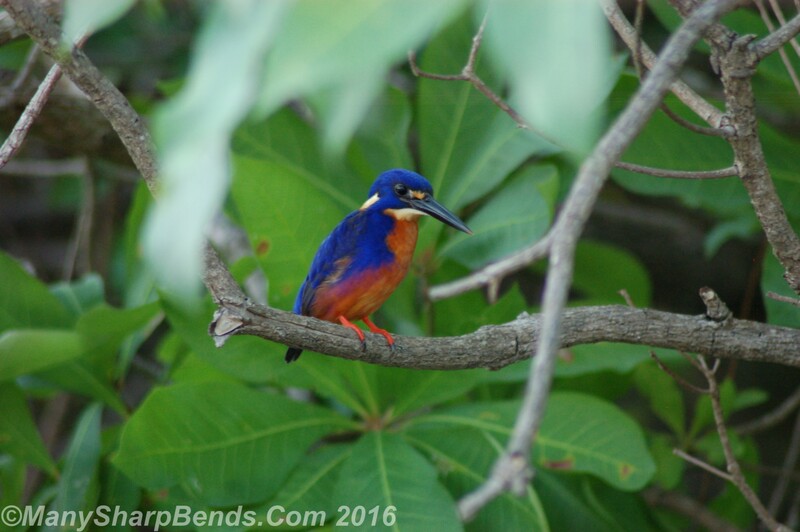 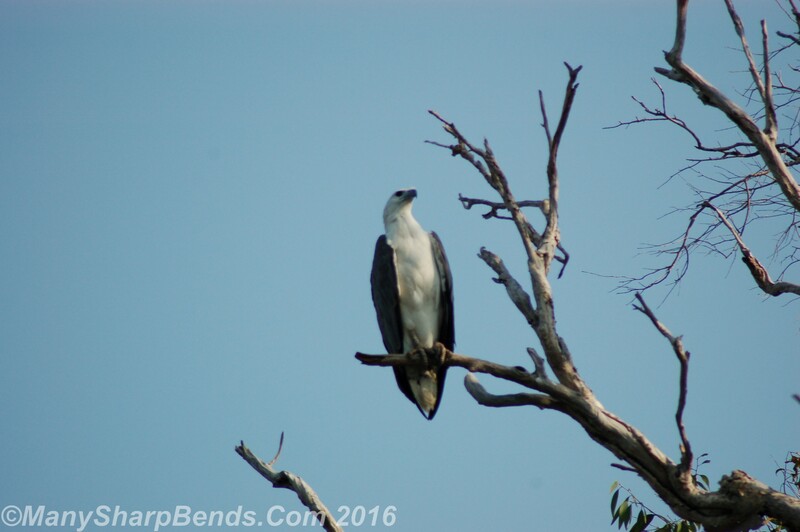 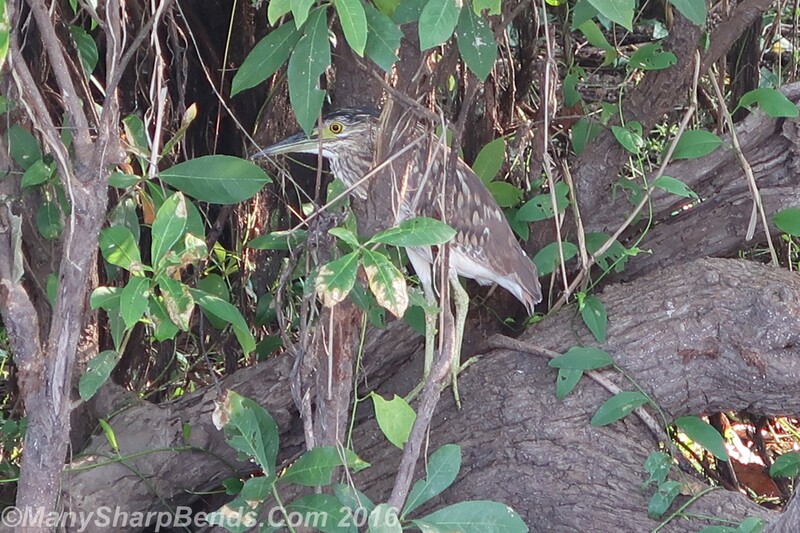 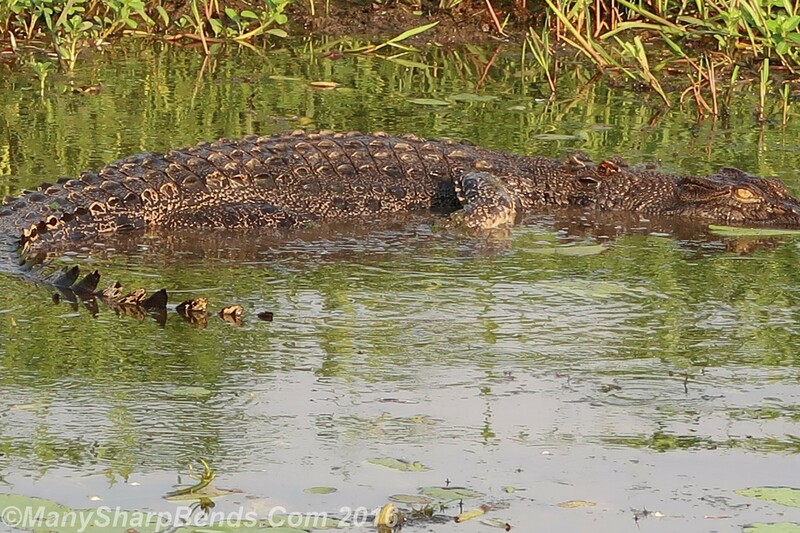 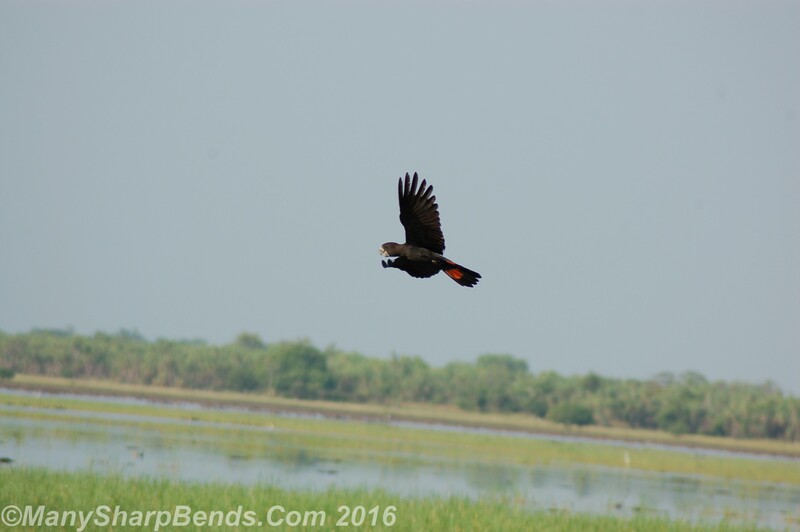 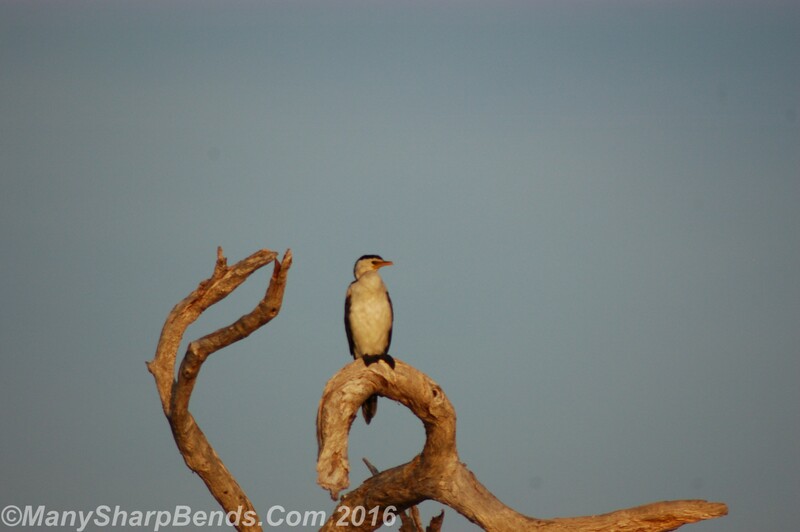 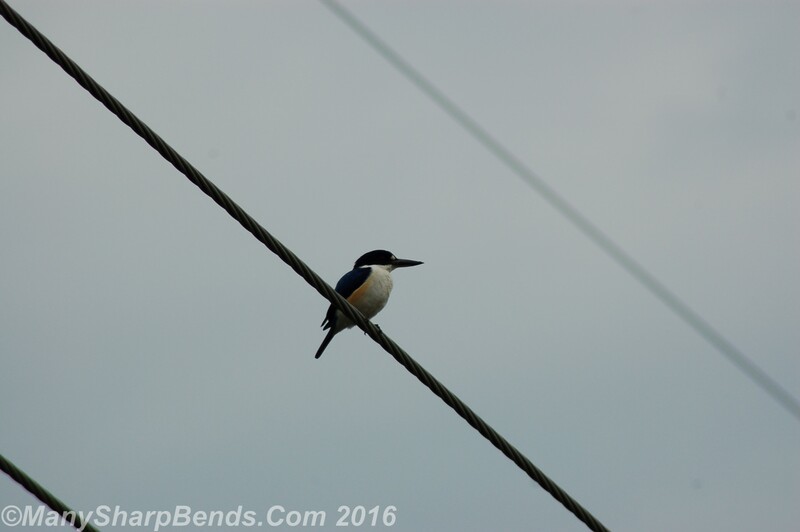 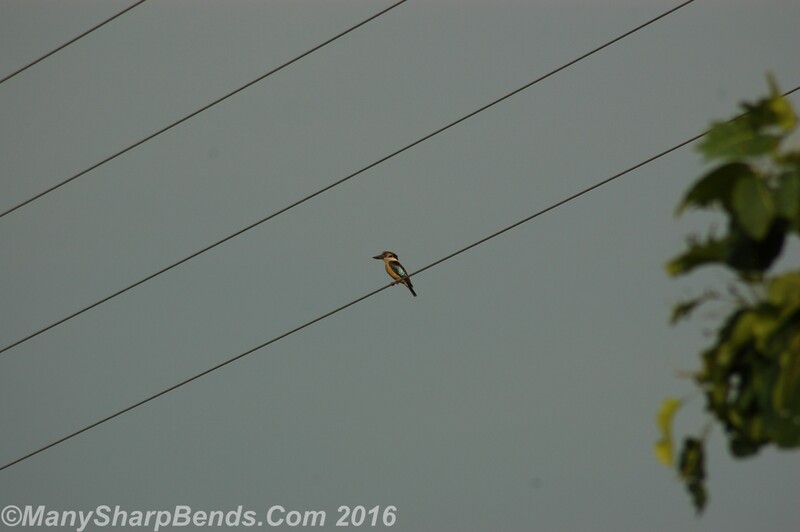 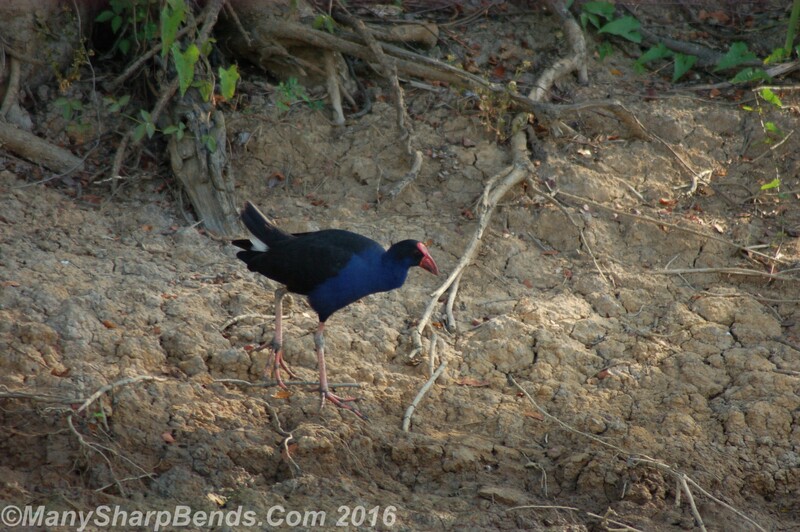 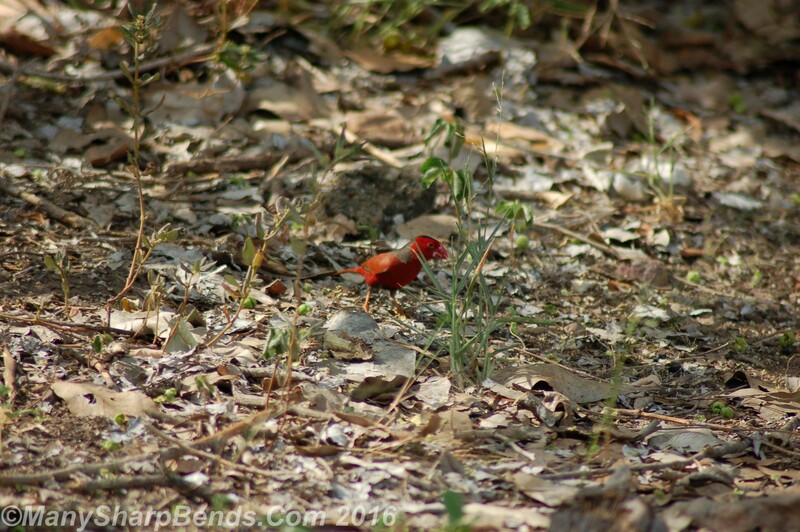 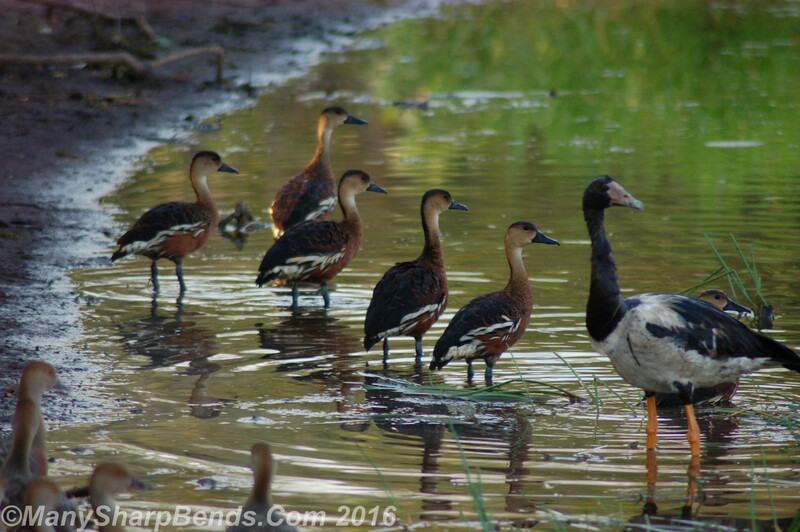 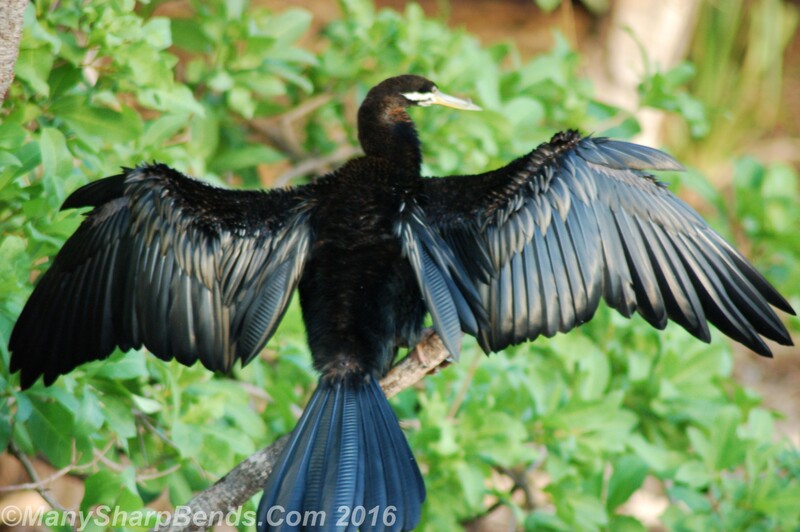 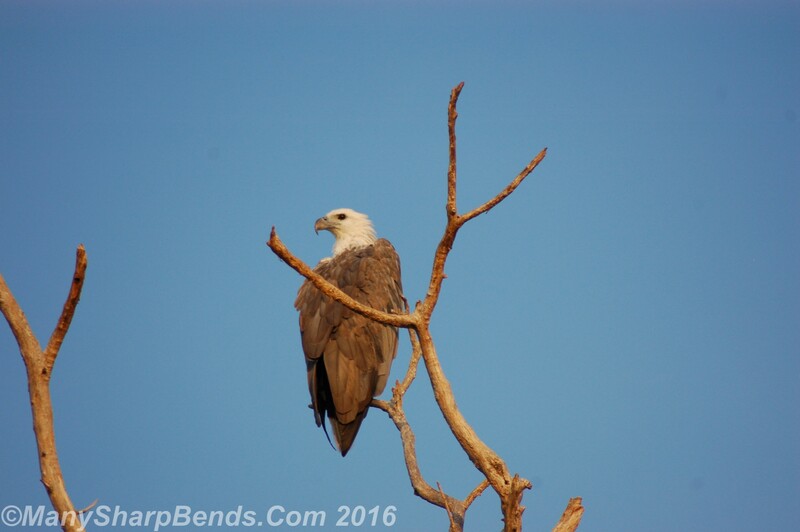 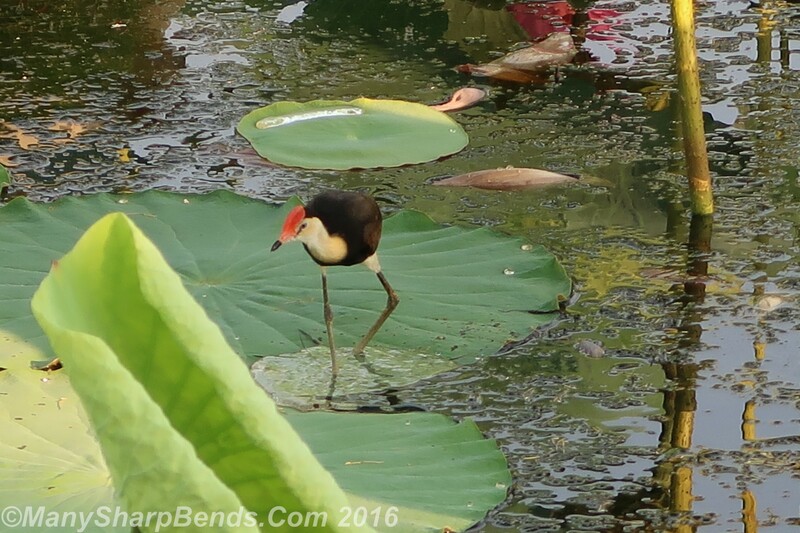 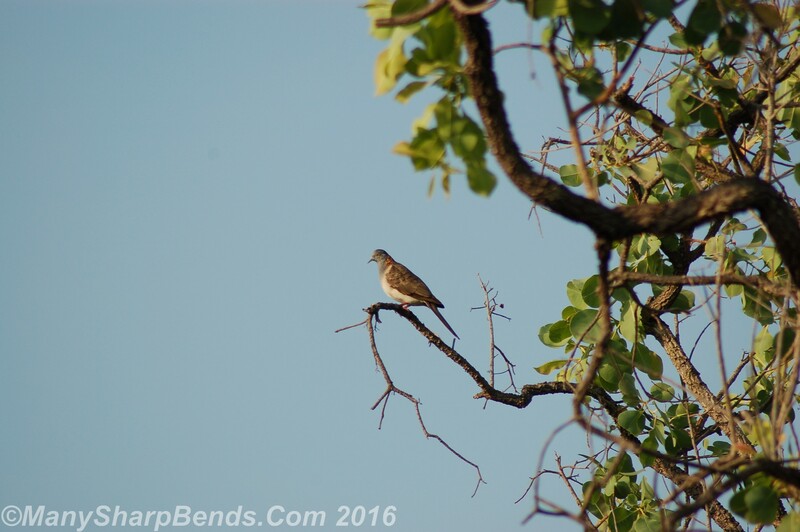 The next morning we were treated to the exquisite bird life of Kakadu in the yellow water cruise. 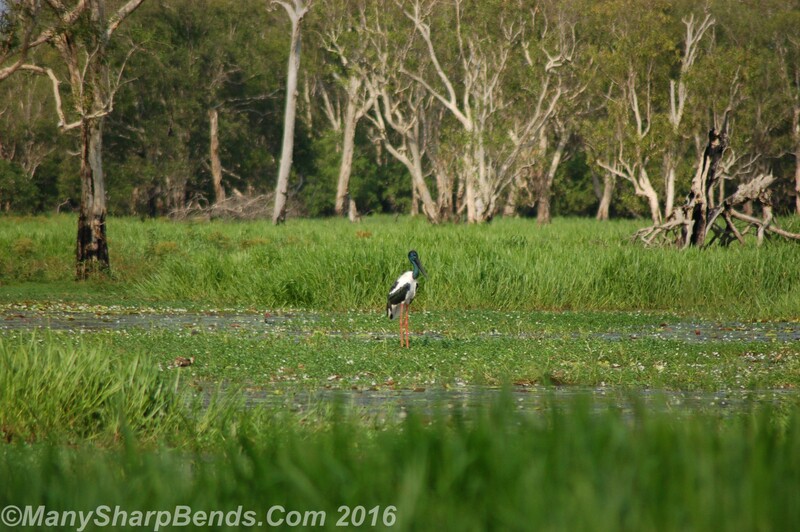 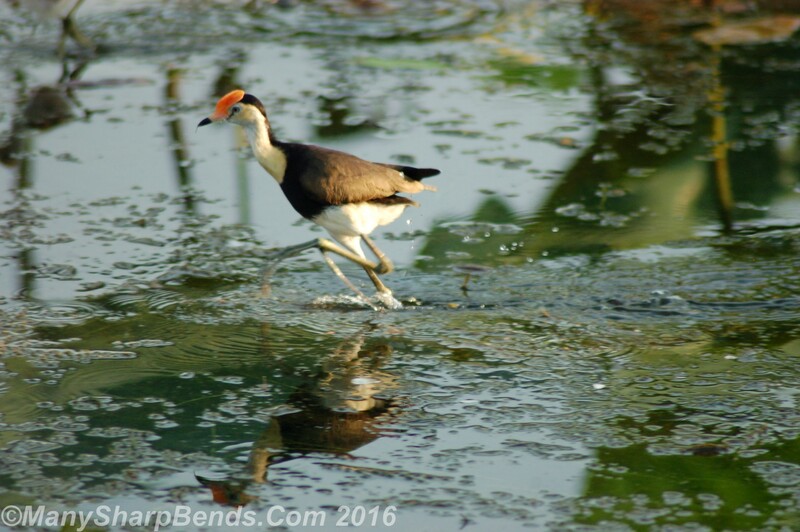 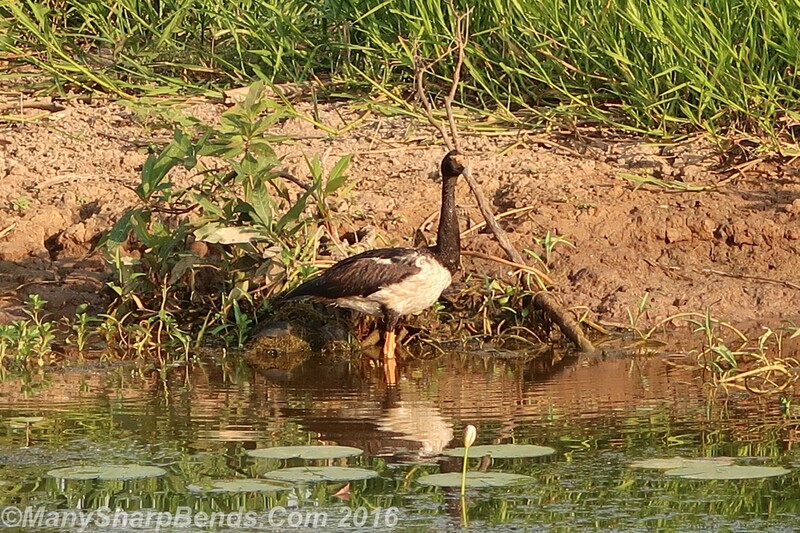 Highlights include magpie goose, green pygmy goose, pelicans, Jabiru stork, herons, egrets, cormorants, eagles, kites, kingfishers, crocodiles and much more. 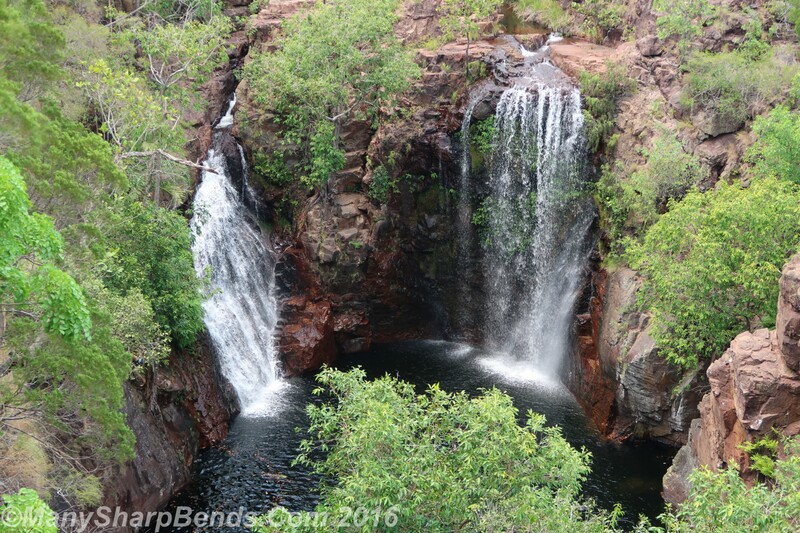 The creeks that cut through the park result in mighty waterfalls in the rainy season. 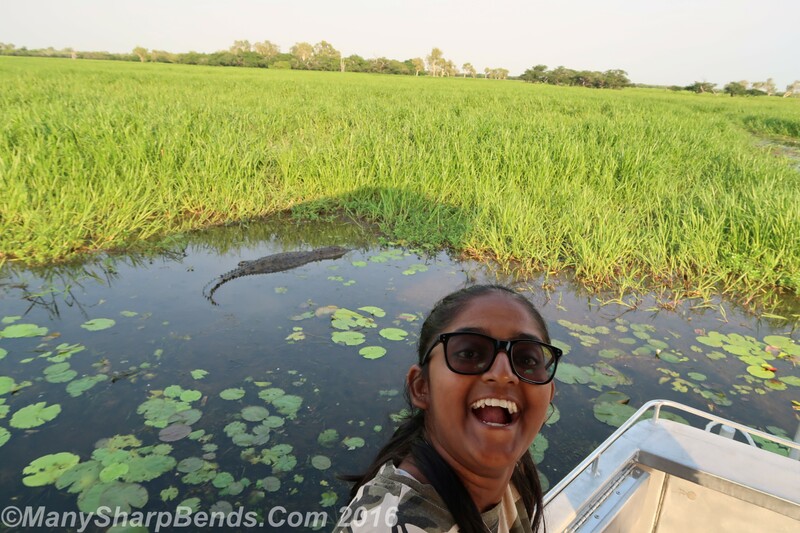 Then they flood the plains to the West Alligator, South Alligator and East alligator rivers – no alligators are found in Kakadu, only crocodiles !! 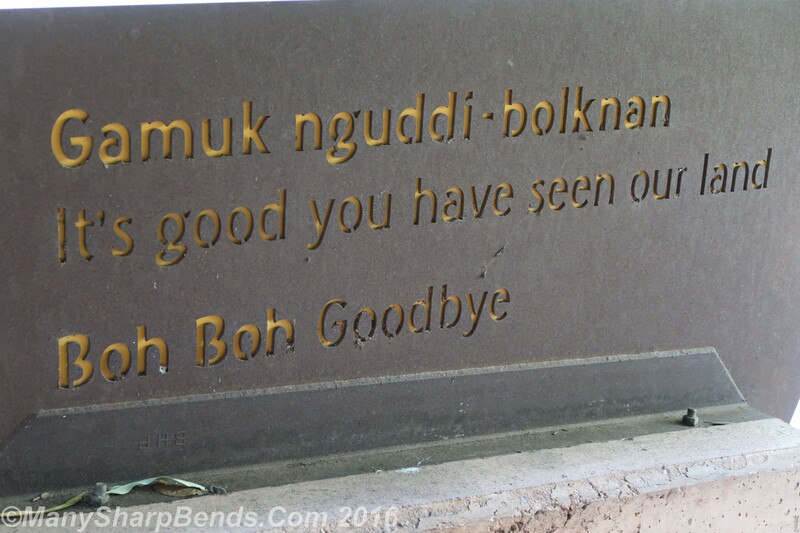 Those are the amusing side effects of colonization – some clueless idiot names stuff wrongly and it stays! 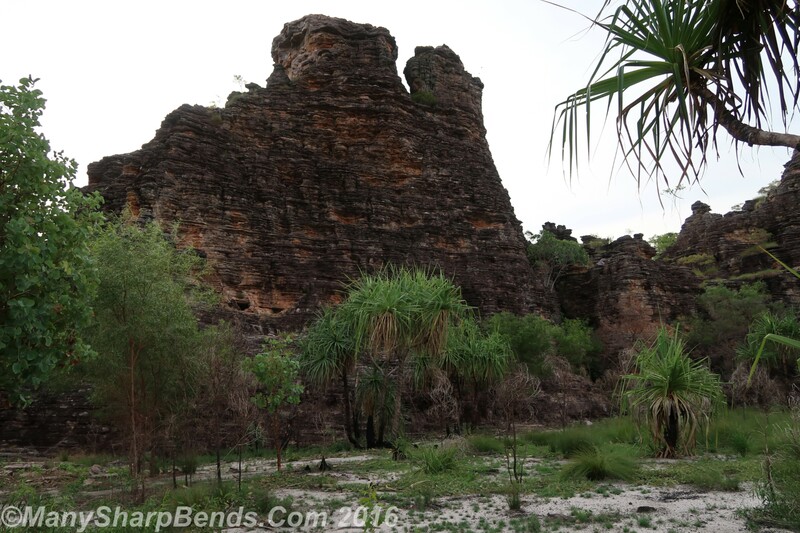 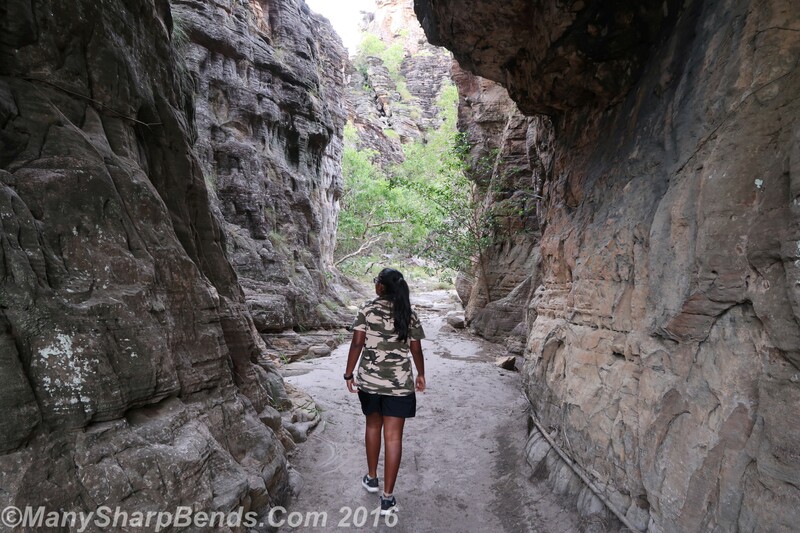 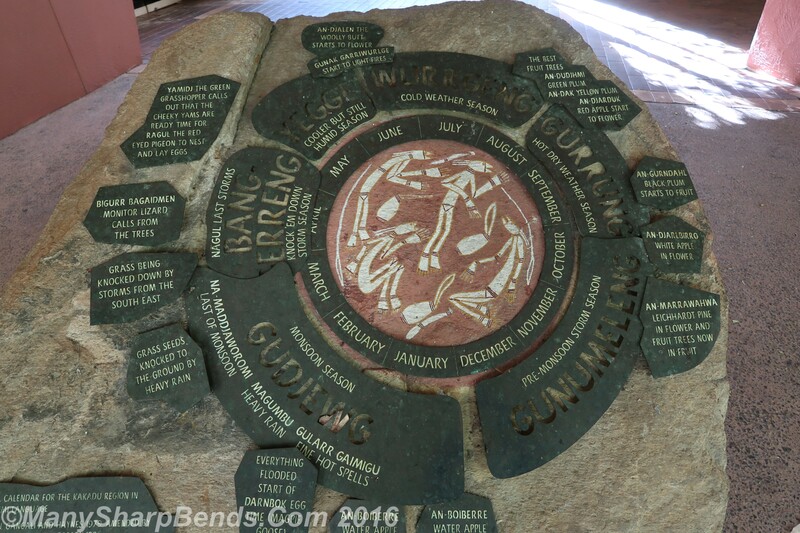 After the yellow water cruise, we headed off to Jabiru and enroute did the 2 km Bardeddjildji Sandstone walk. 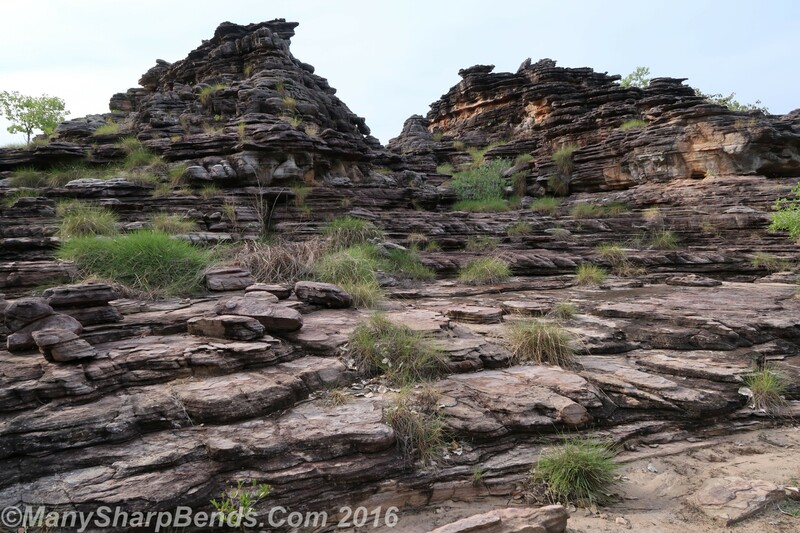 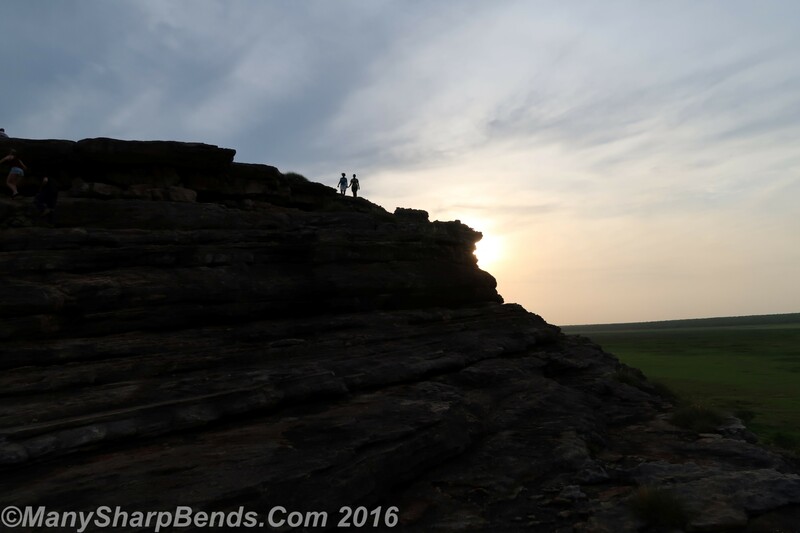 You are rewarded with some wonderful eroded sandstone formations. 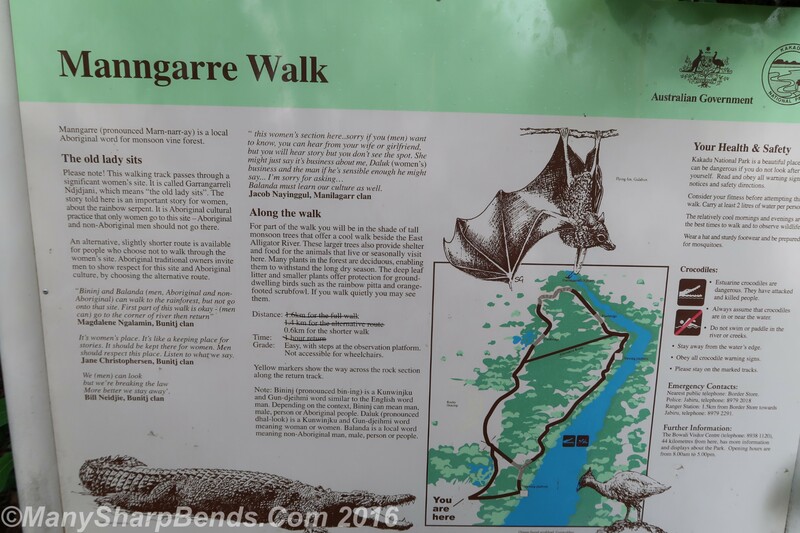 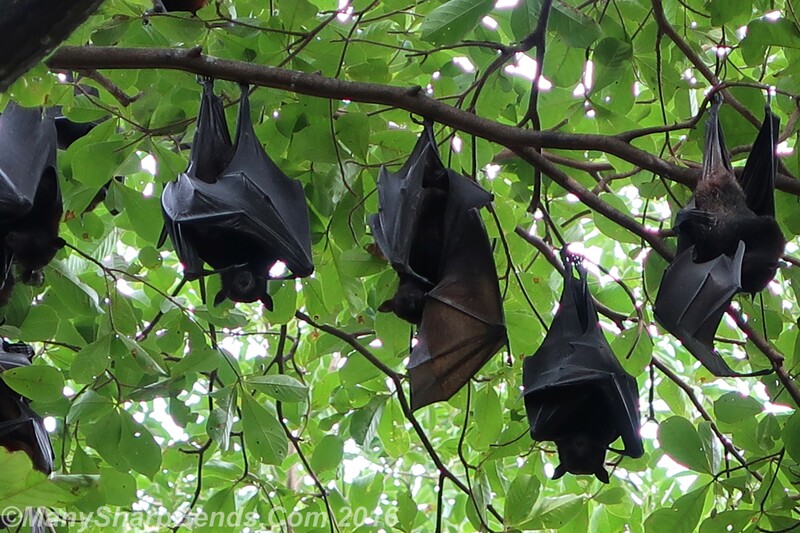 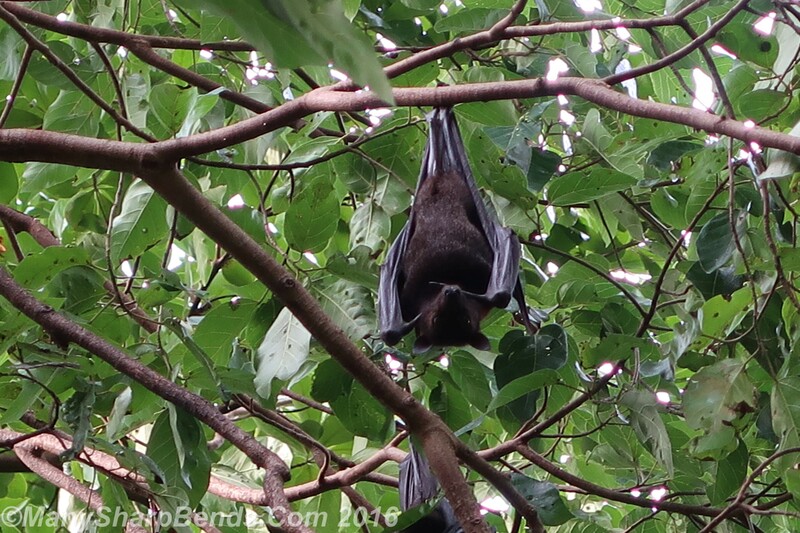 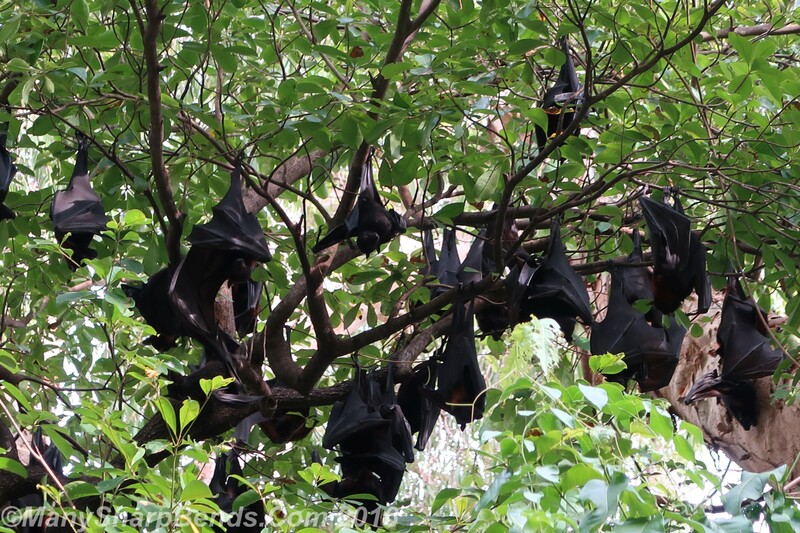 Next up was Manngarre Monsoon forest walk where we encountered thousands of bats – never seen anything like this before ! 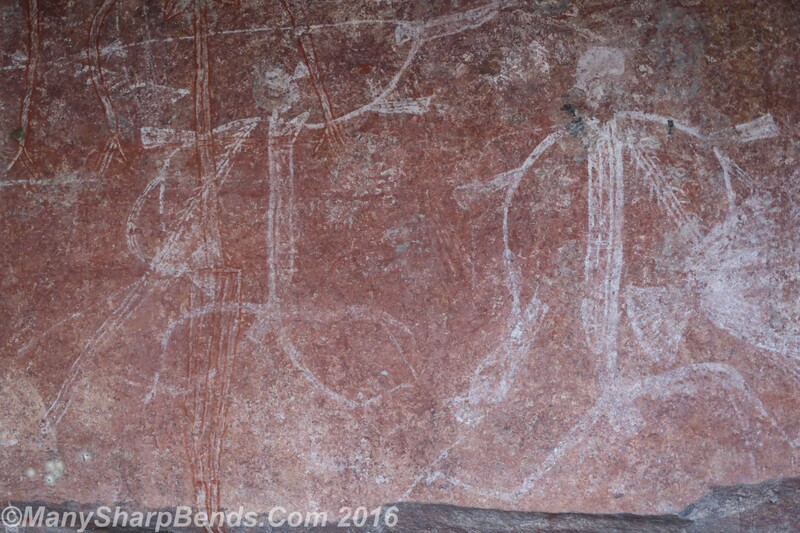 Close to Jabiru, Ubirr is the second mecca of Aboriginal rock art, apart from Nourlangie. 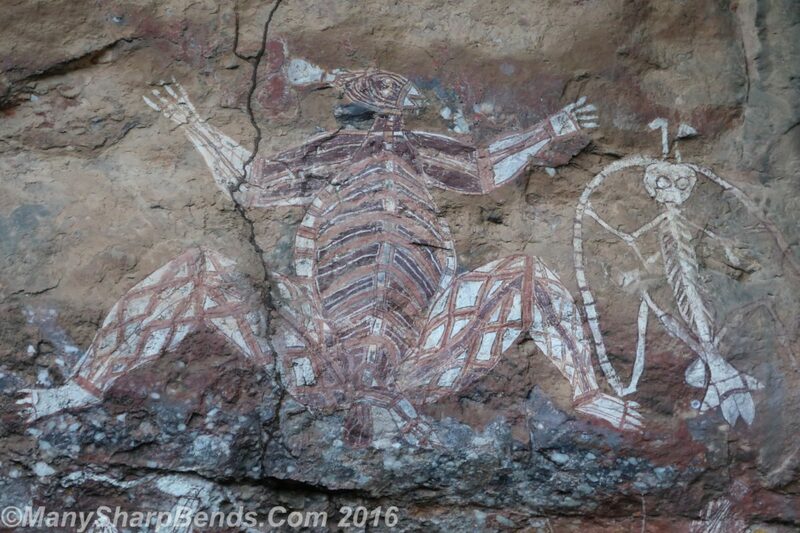 Images include kangaroos, tortoises and x-ray fish – this was the main style 8000 years ago. 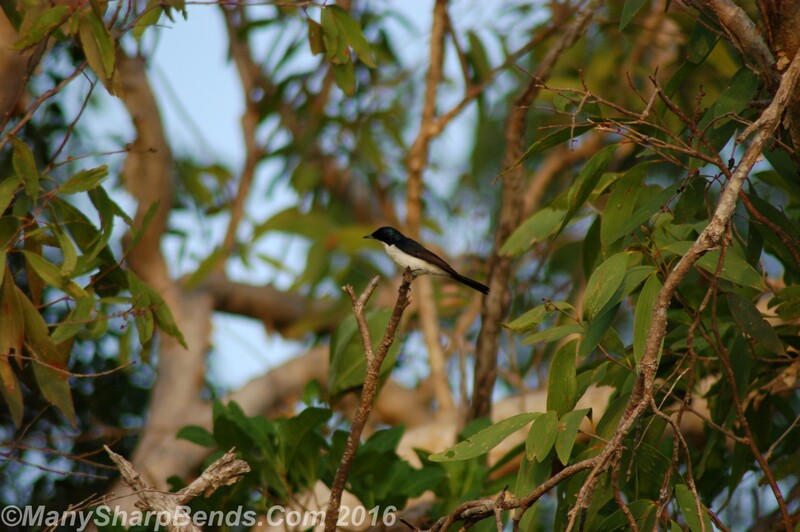 We spent an hour at the Nardab Lookout, which provided lovely views of Jabiru from the escarpment. 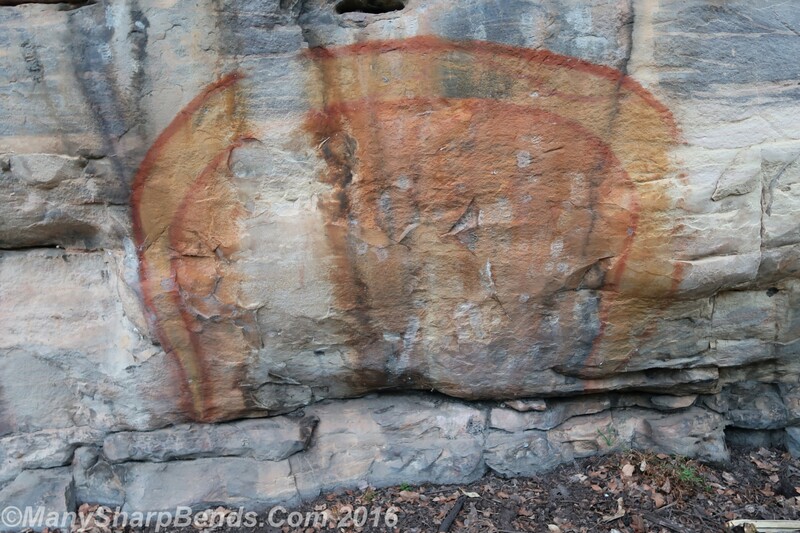 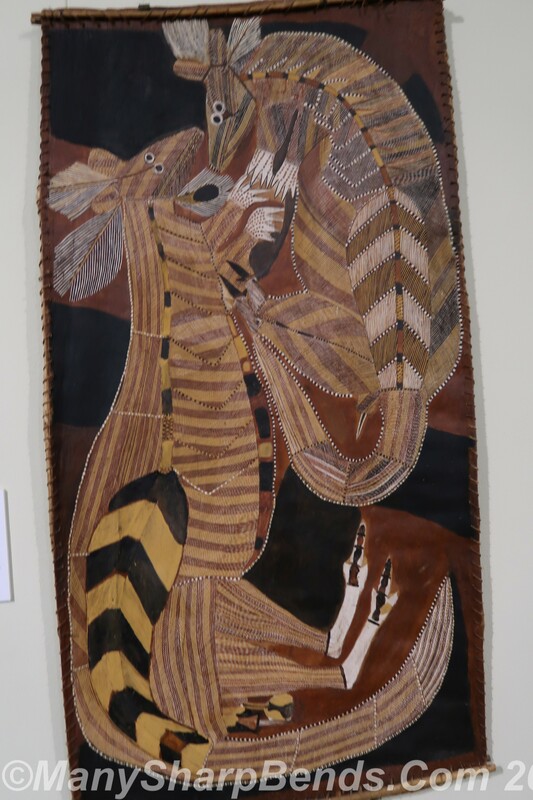 This painting at Ubirr is of Rainbow Serpent – a deity specially revered by the Aboriginal people. 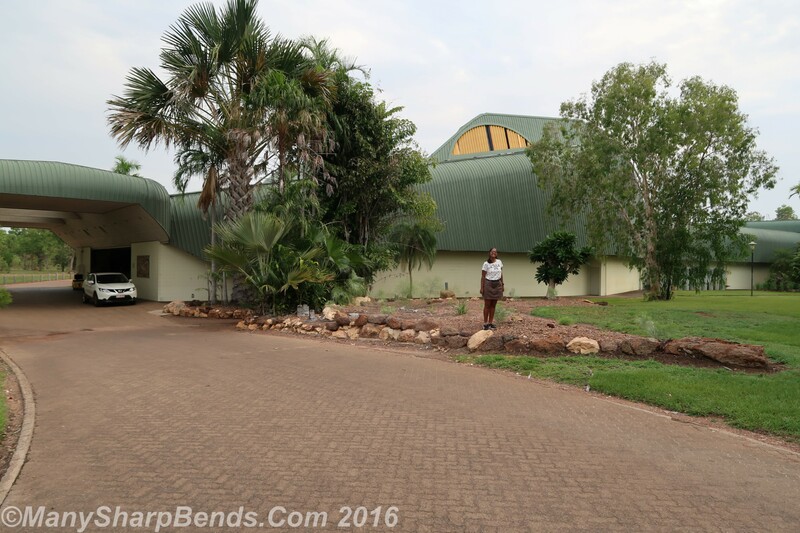 At Jabiru, we checked into the Mercure Crocodile hotel, which is shaped as a crocodile ! 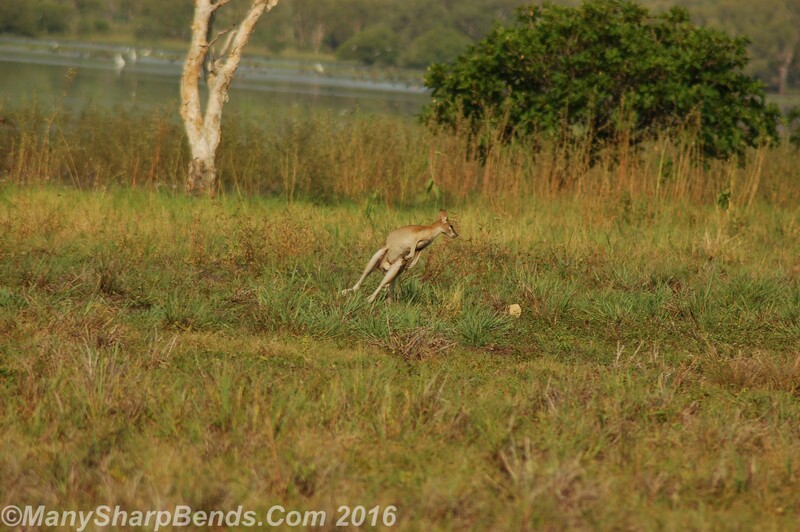 The deal with Mika the next morning was that mummy & daddy would sneak out at 6 am to Mamakula wetlands while she slept. 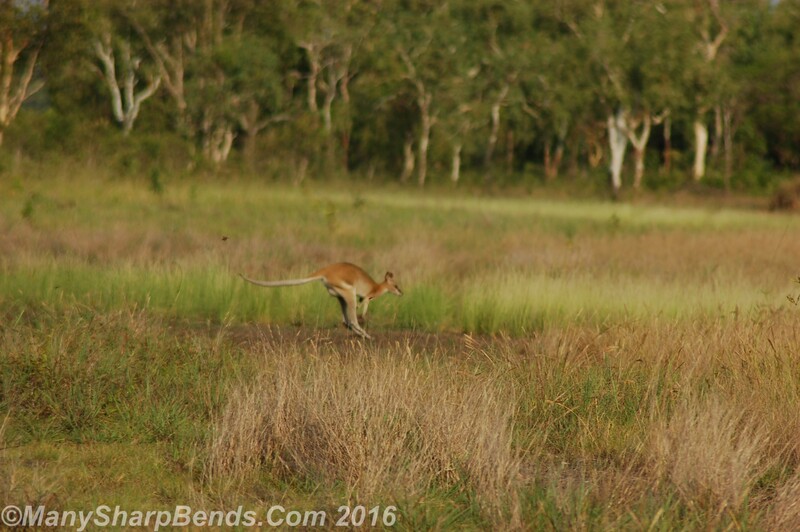 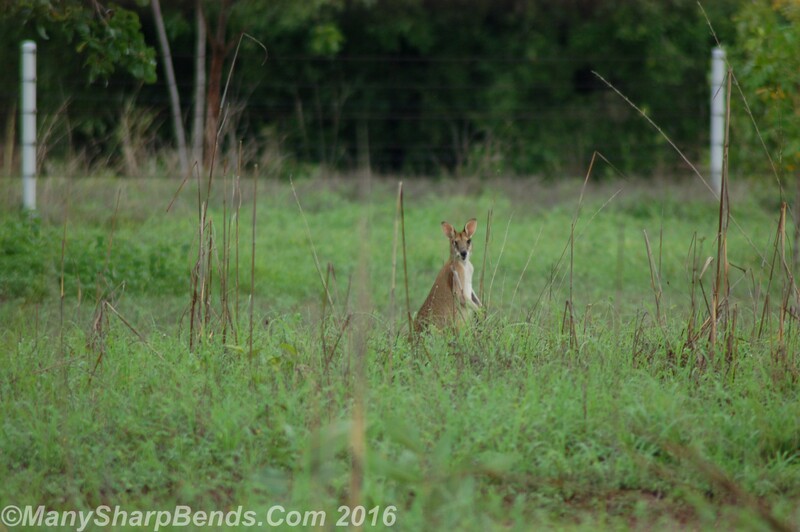 Mamakula,20 km east of South Alligator river, has some wonderful bird watching opportunities and we were additionally rewarded with a kangaroo encounter in the classic “jumping” pose. 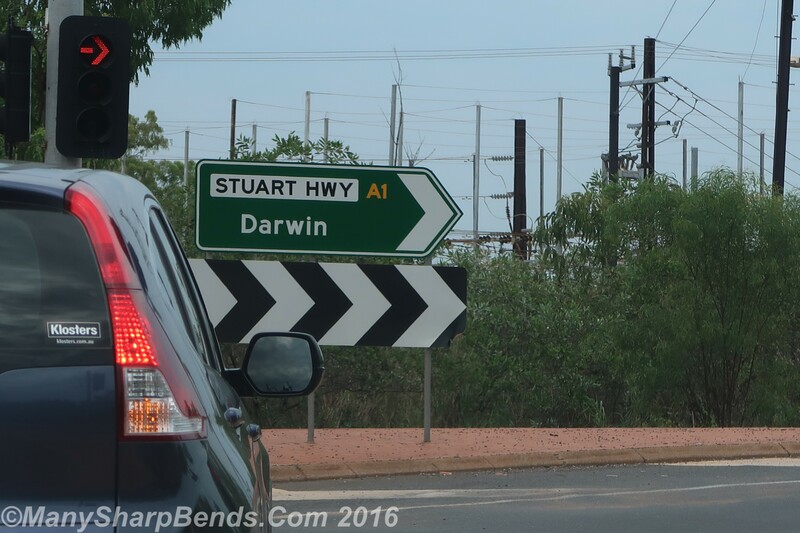 It was time to sleep rest of the day and commence our 4 hour journey the next morning to Darwin airport via Arnhem Highway. 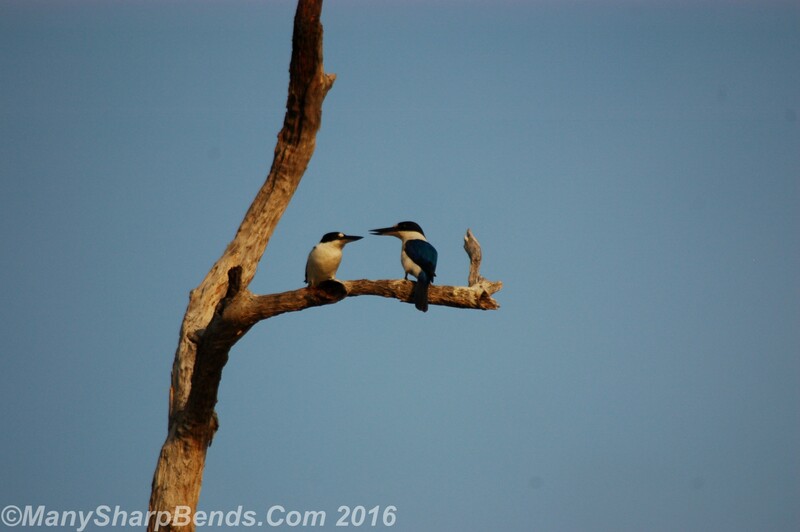 All of Meha’s wildlife wishes had been fulfilled except the sighting of the Blue-winged Kookaburra. 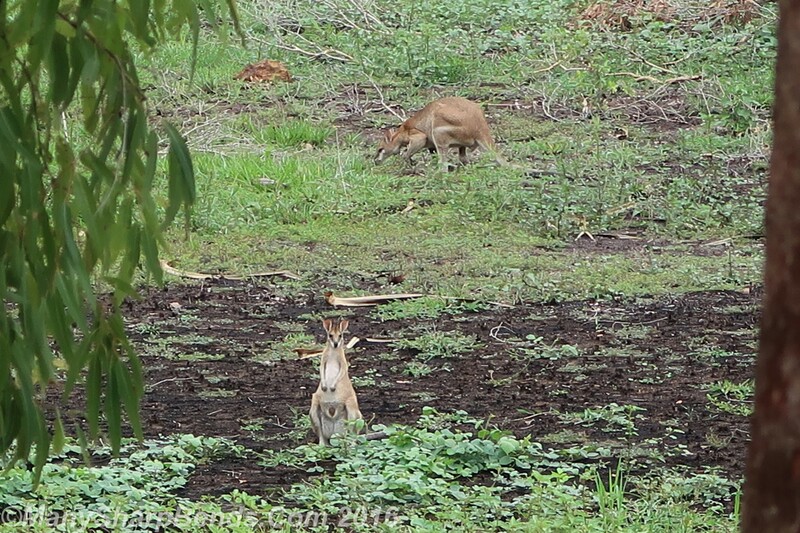 God obliged again with “Tathastu” (So be it) and we had the sighting within 15 minutes !! 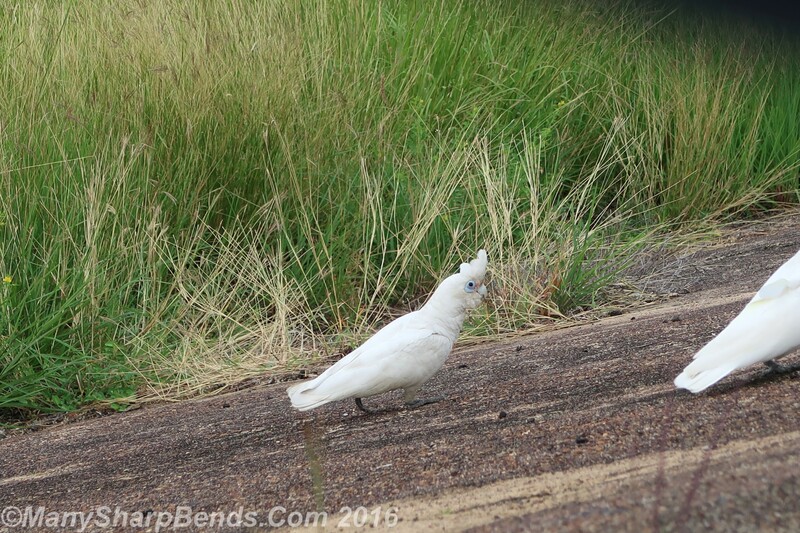 And we had our last meeting with the Cockatoos ! 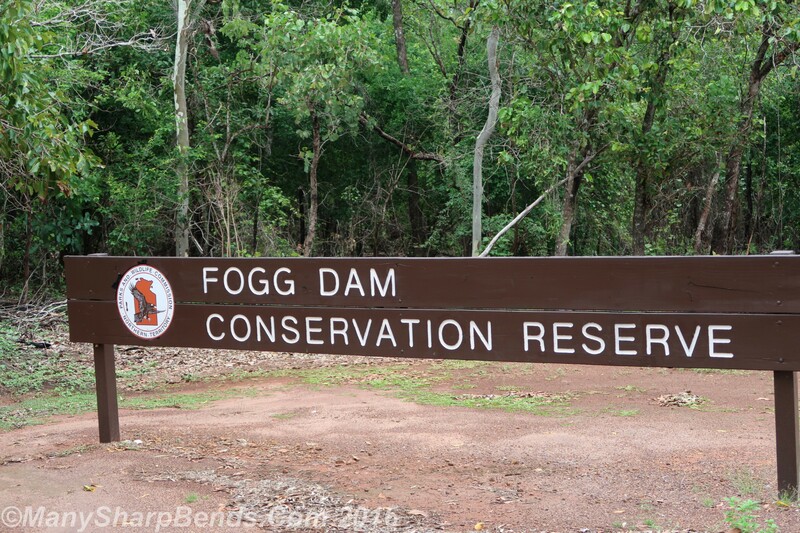 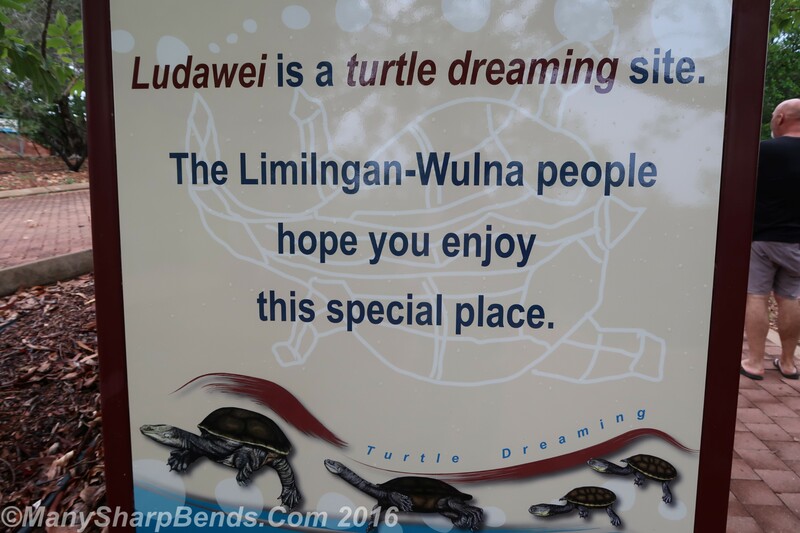 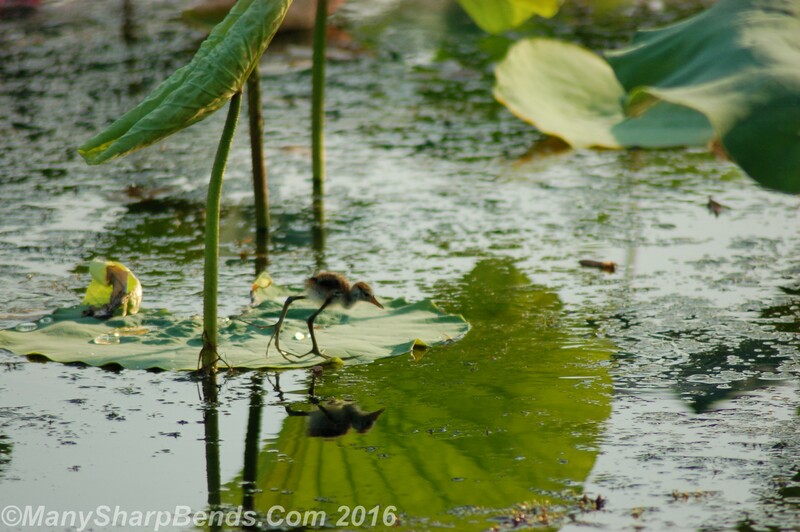 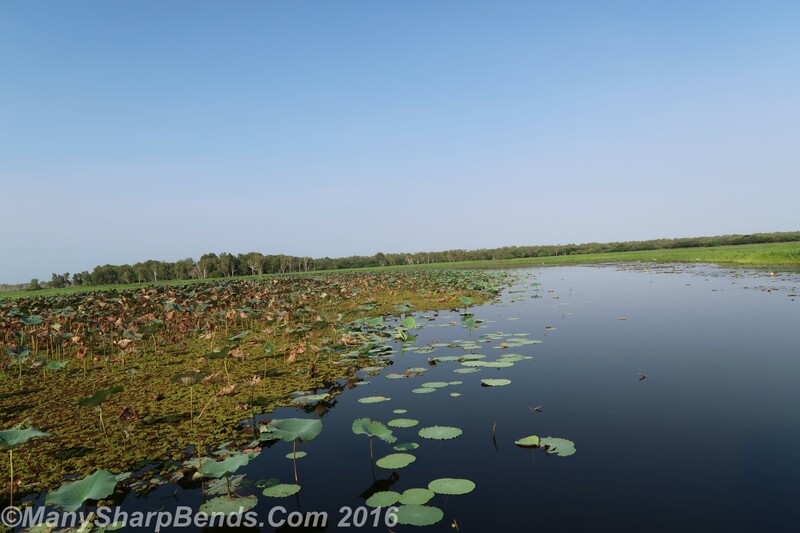 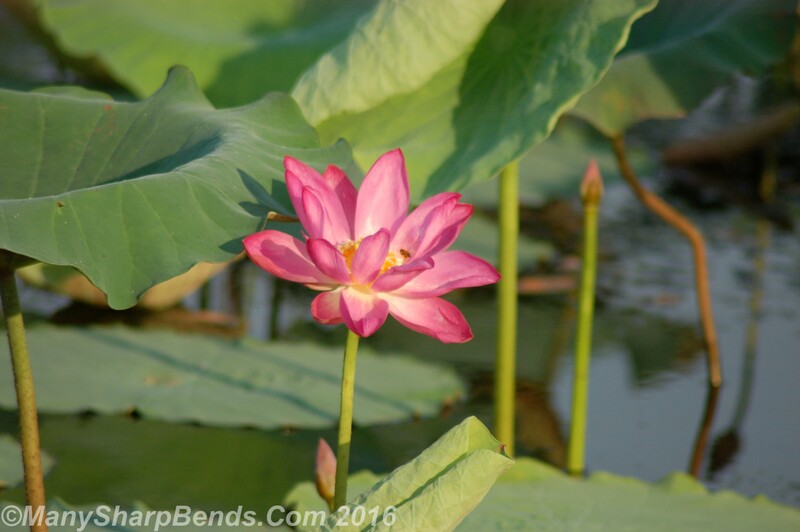 We made a brief stop at Window on the wetlands and Fogg Dam – two very educational resources on the birds and wildlife of the region. 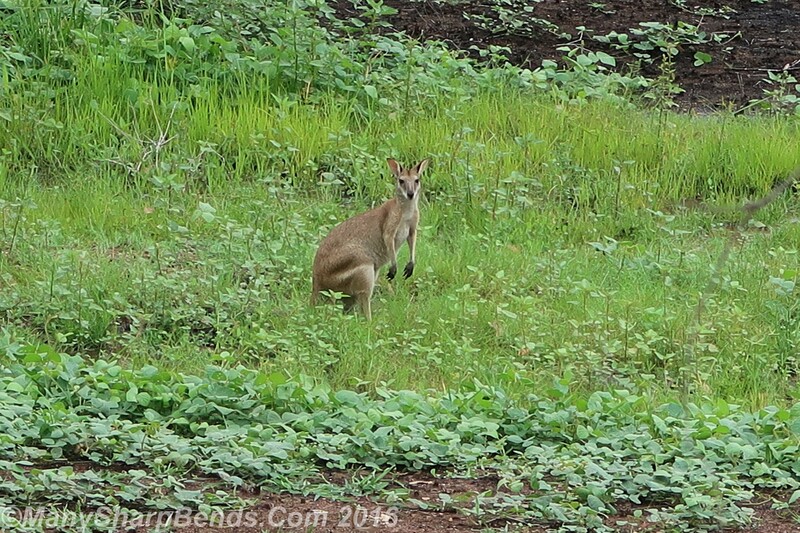 And the last Kangaroo sighting !